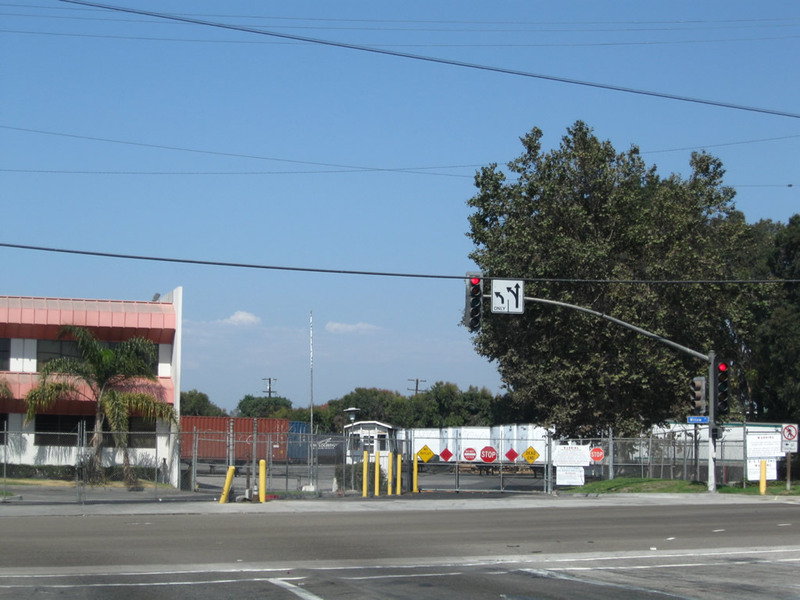 Turning south from Willow Street onto California 103 (Terminal Island Freeway) south is this initial freeway entrance shield assembly for California 103 south. 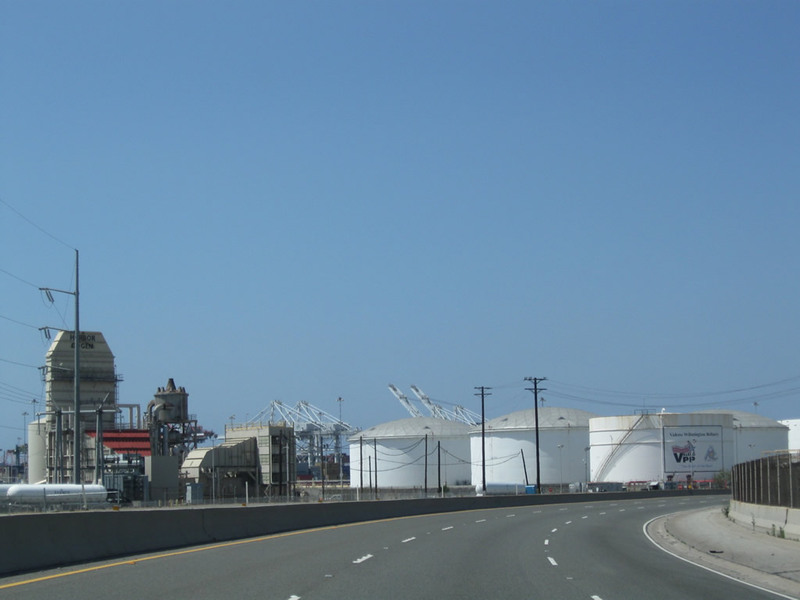 This short state route travels south and then southeast to join with California 47 for the trek onto Terminal Island, ending at the Interstate 710 and Ocean Boulevard interchange. Photo taken 05/02/10. 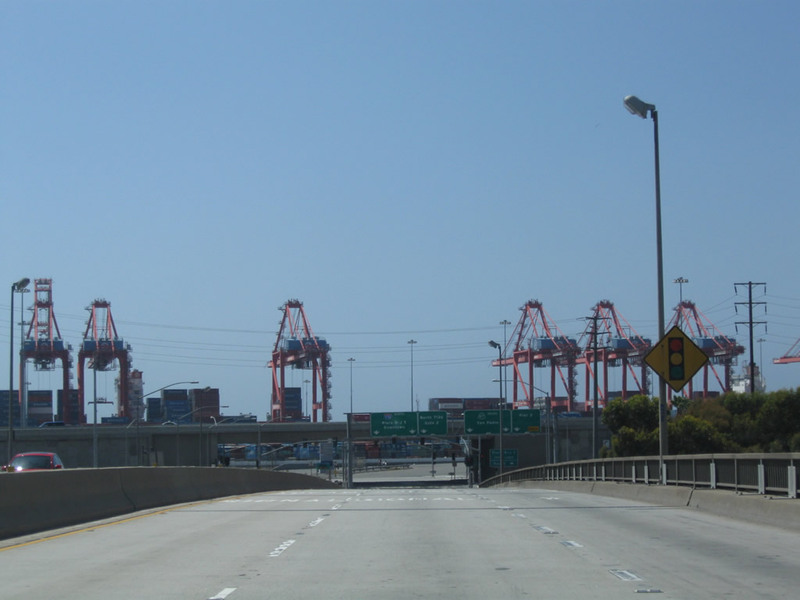 California 103 is the Terminal Island Freeway. 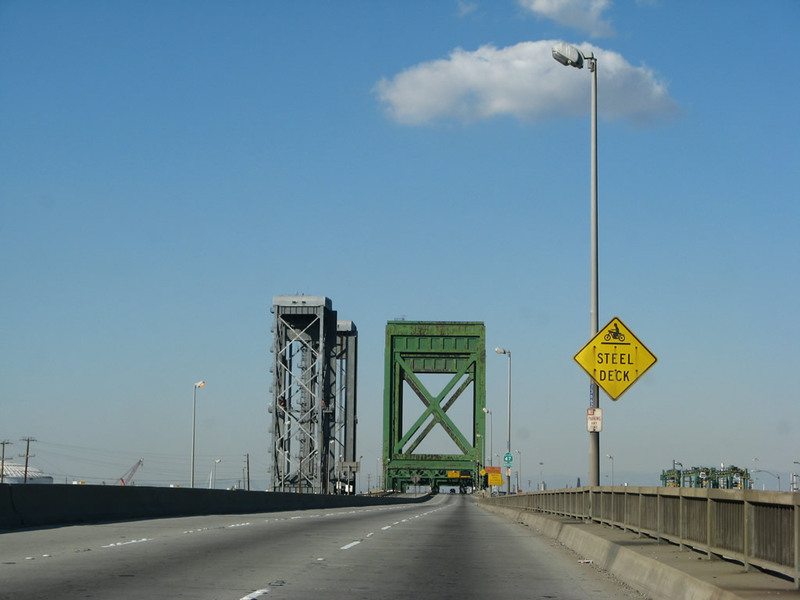 It is signed between Interstate 710 (Ocean Boulevard) and Willow Street, which is the entire extent of the Terminal Island Freeway. 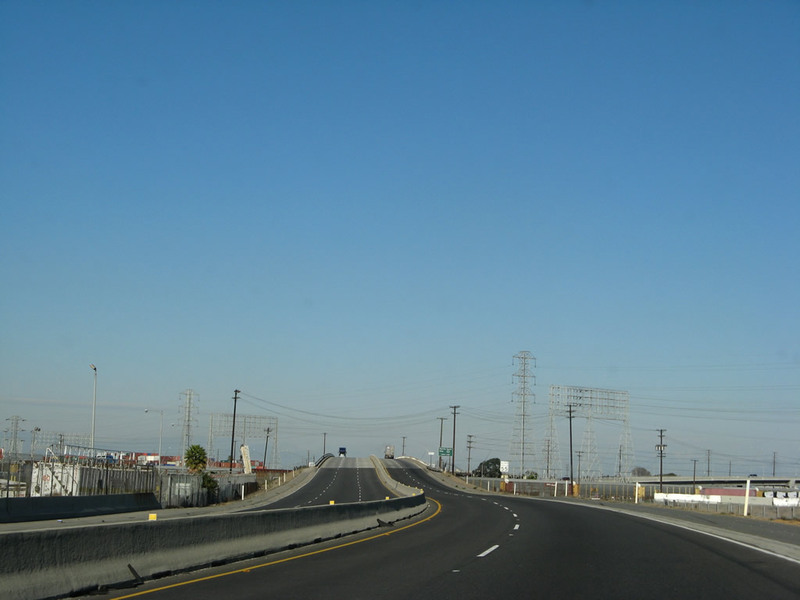 Legislatively, the constructed section of California 103 begins at the split from California 47 at the Anaheim Street and Henry Ford Avenue interchange and ends at Willow Street, with an unconstructed portion continuing northeast toward the Interstate 405 and Interstate 710 interchange northwest of downtown Long Beach. 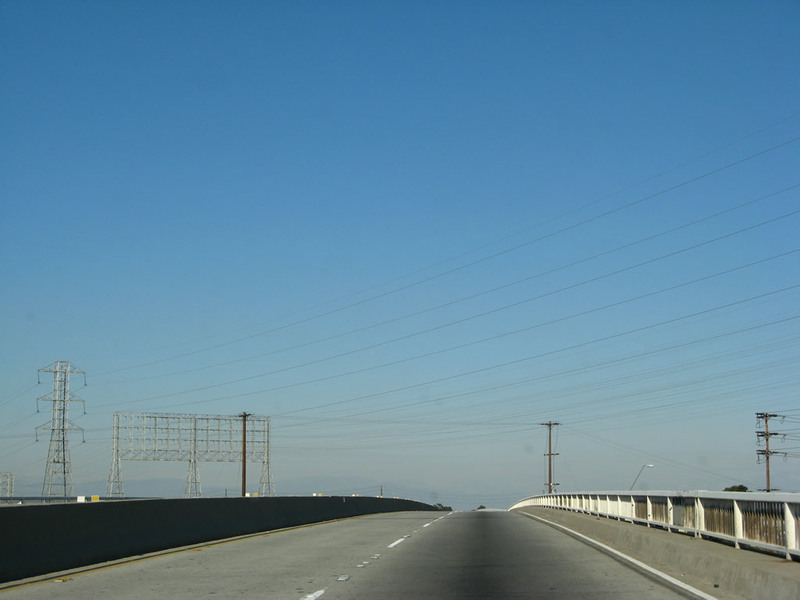 A short state route that is entirely located on the route of the Terminal Island Freeway, California 103 is linked to the route of nearby California 47. 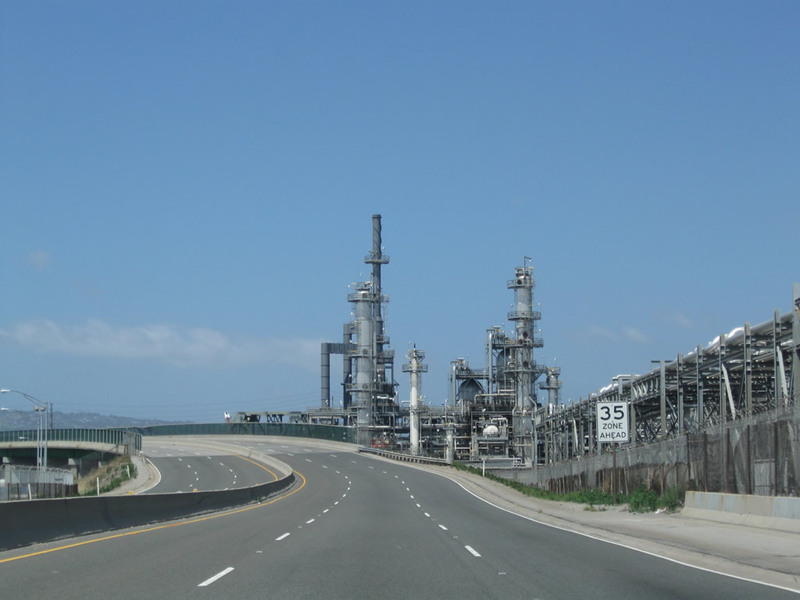 California 103 shares alignment with California 47 for the first mile, then the routes divide. 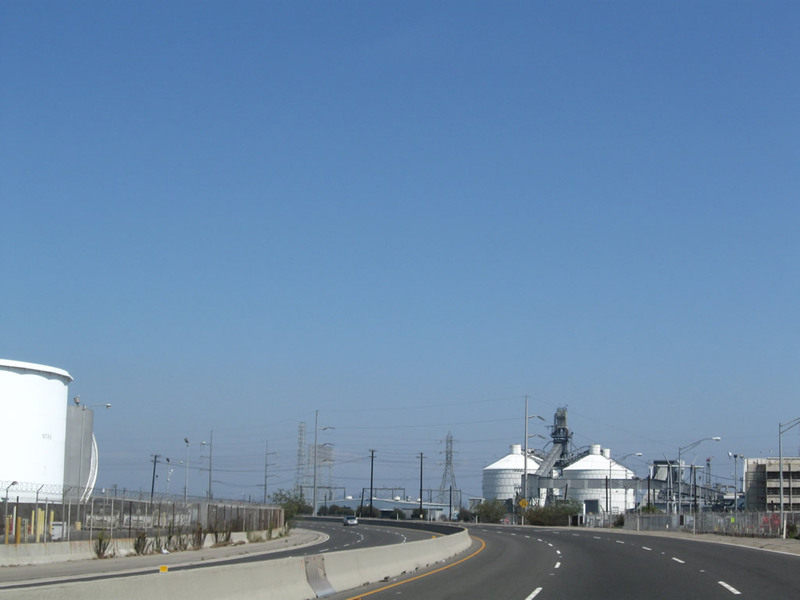 California 47 departs the Terminal Island Freeway at Exit 4, Anaheim Street and Henry Ford Avenue. 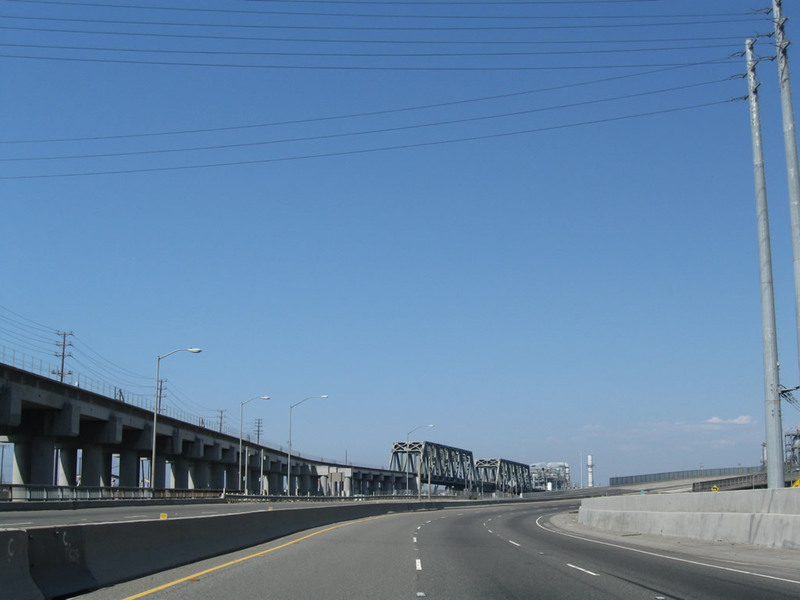 At this point, California 47 merges onto the Alameda Street corridor. 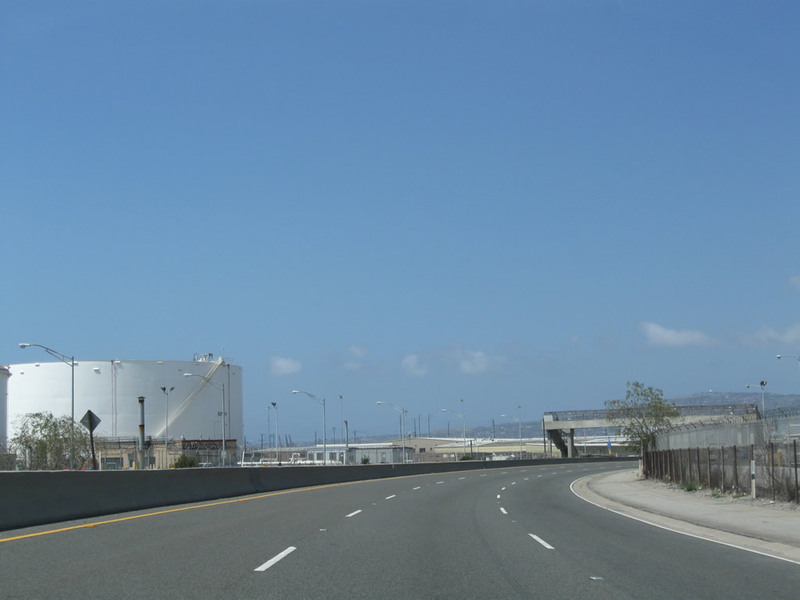 California 103, meanwhile, continues north along the Terminal Island Freeway past an interchange with California 1 (Pacific Coast Highway) until ending at a traffic signal at Willow Street. 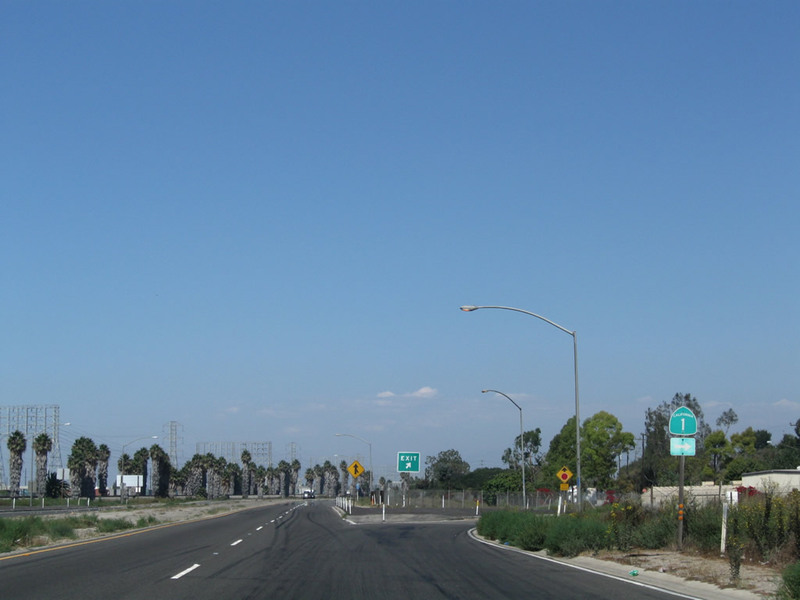 On the section of shared alignment between Interstate 710 (Ocean Boulevard) and Anaheim Street, signage is posted for both California 103 and California 47. 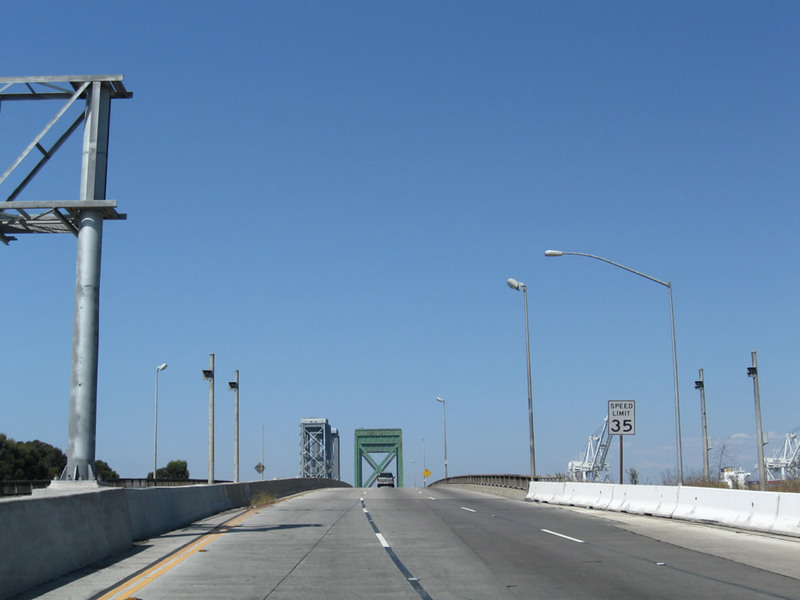 Both routes are marked from Ocean Boulevard, but the reassurance shields mostly only show California 47. 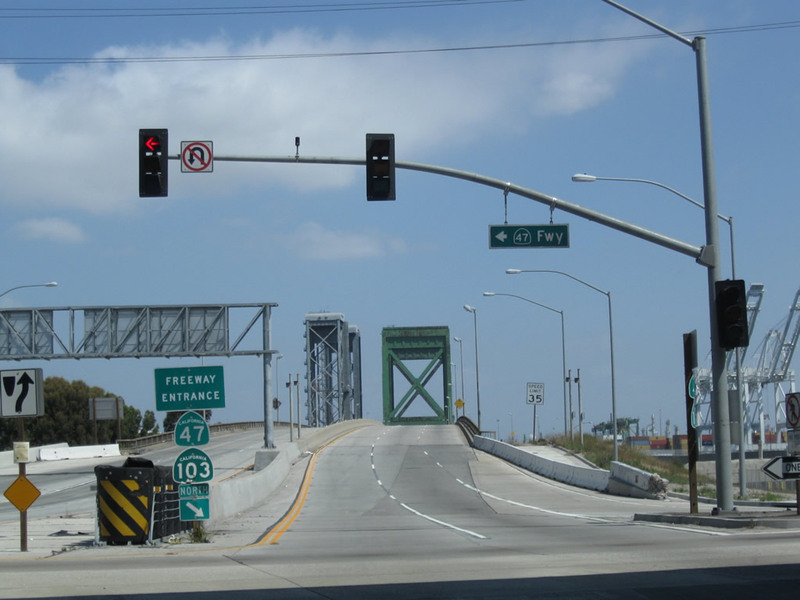 After passing under the Interstate 710 freeway bridge, northbound California 47-103 meets this traffic signal at the north frontage road for Ocean Boulevard. California 103 begins here. 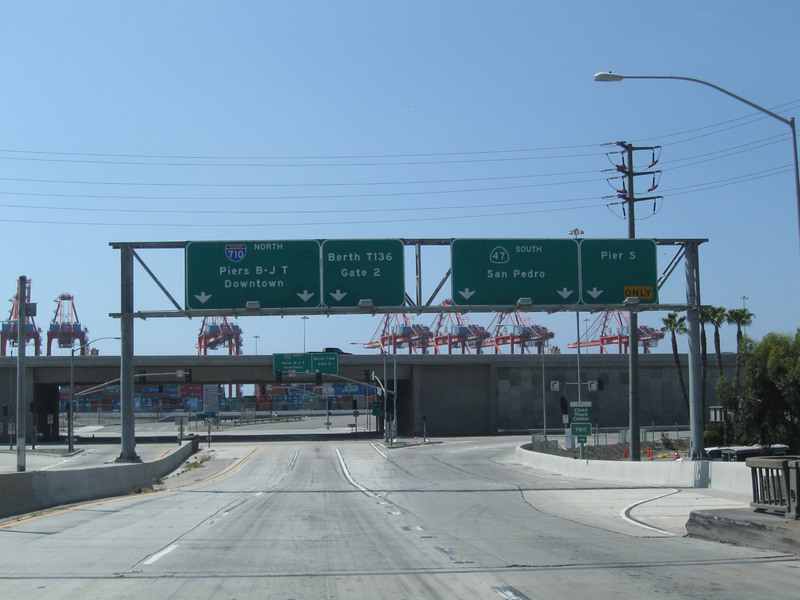 The Terminal Island Freeway begins after passing through this signalized intersection. Photo taken 05/02/10. 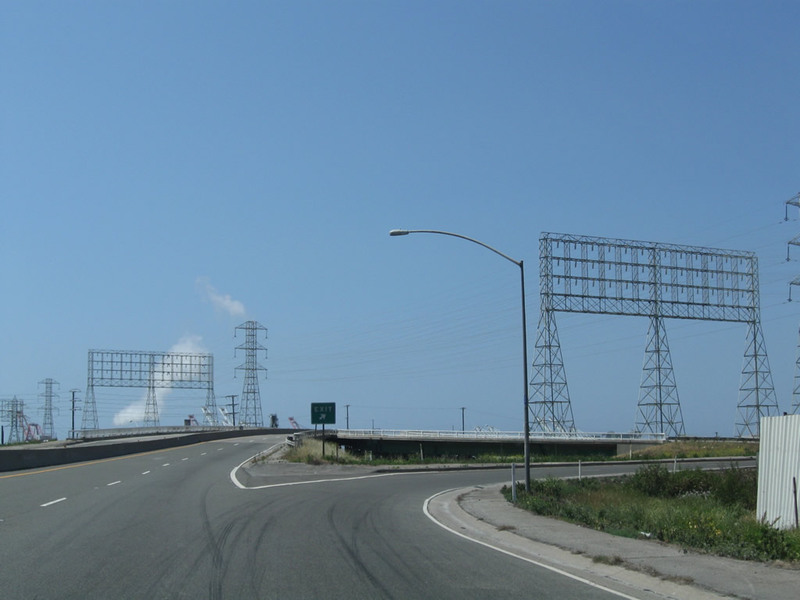 A freeway entrance shield assembly marks the beginning of the Terminal Island Freeway along SR 47 & 103 northbound. Photo taken 05/02/10. 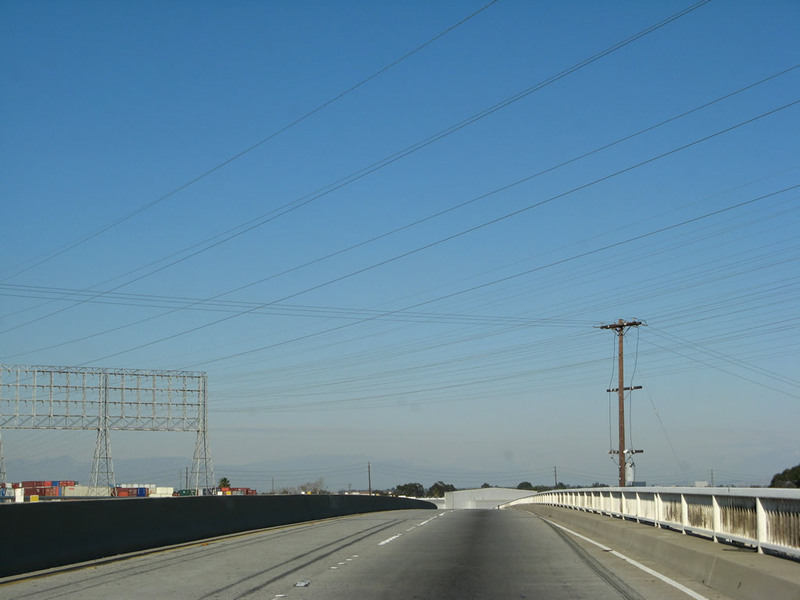 California 47-103 starts as a substandard freeway, with a reduced speed limit and limited shoulders. 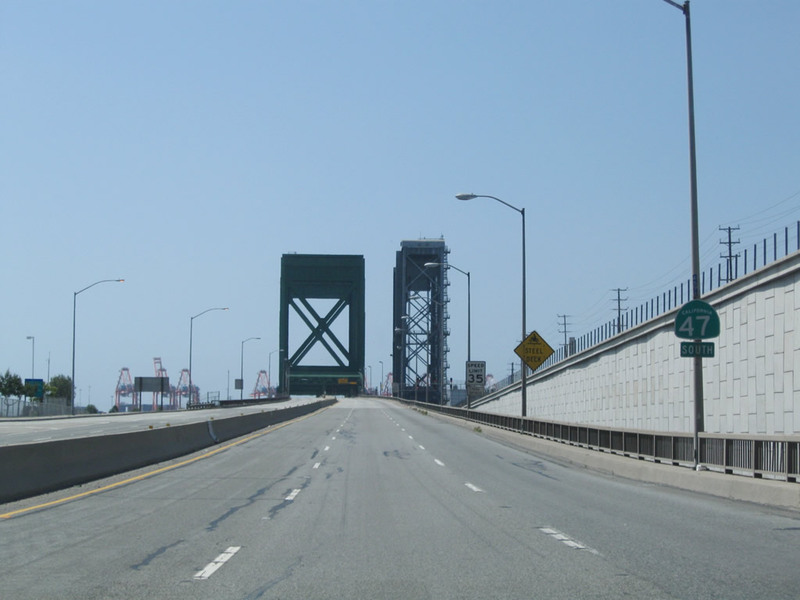 To leave Terminal Island and return to the mainland, California 47-103 (Terminal Island Freeway) will use the Commodore Schuyler F. Heim Bridge. 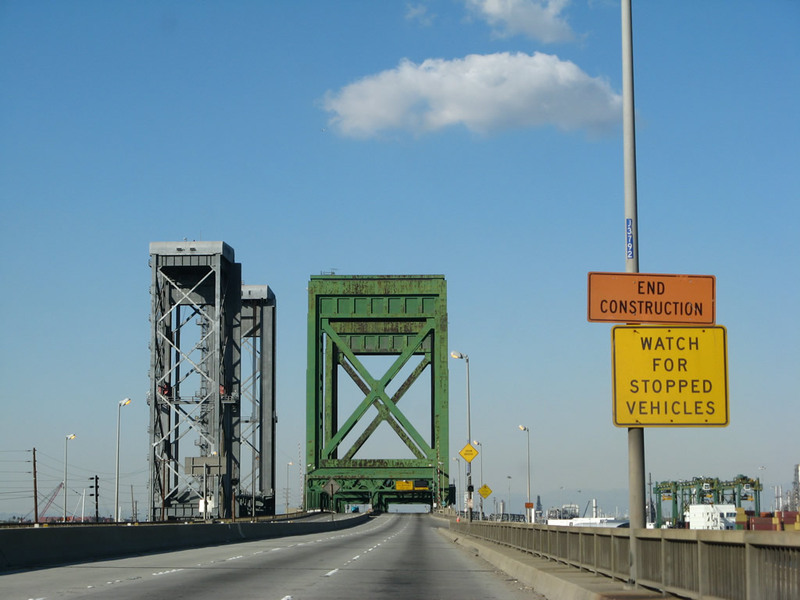 This lift bridge must be raised to allow larger ships to pass underneath it; as a result, the lift bridge can sometimes stop freeway traffic. 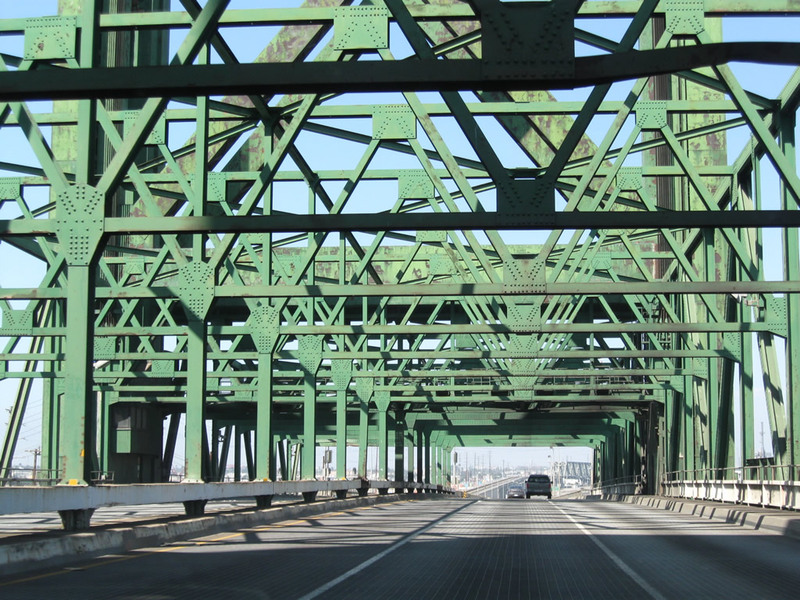 Opened to traffic on January 10, 1948, the Heim Bridge carries vehicular traffic over the Cerritos Channel but is seen as functionally deficient due to heavy truck wear and tear and closures due to lift operations. 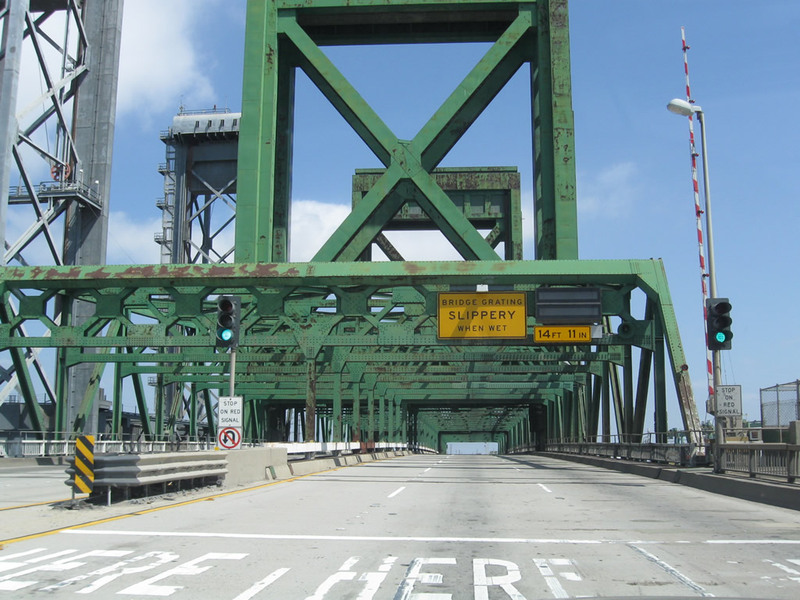 The steel grate deck of the bridge allows for a lighter deck for lifting purposes.1 Plans call for the Heim Bridge to be replaced by a new span as part of the Port Access Expressway project to be coordinated by Alameda Corridor Transportation Authority. Photos taken 05/02/10, 07/13/09, 01/14/07, and 05/30/04. 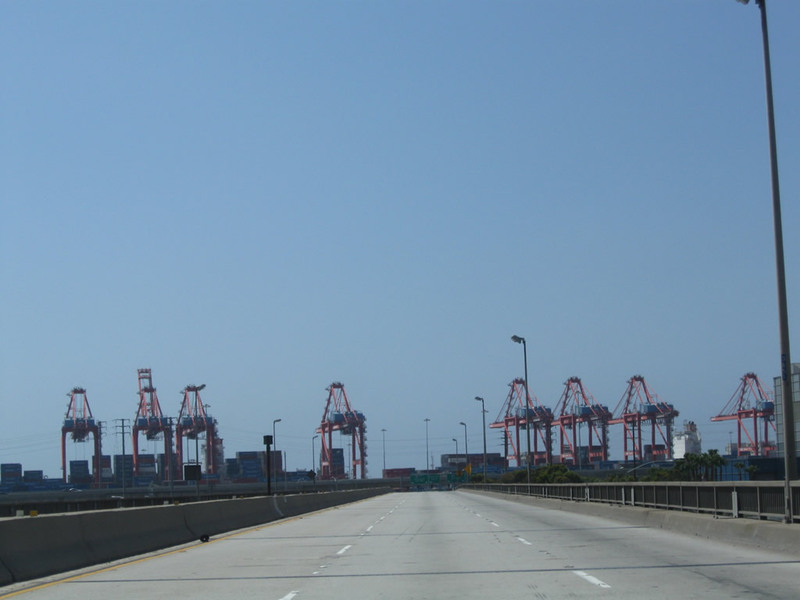 California 47-103 (Terminal Island Freeway) leave Long Beach and enter the city of Los Angeles after departing from Terminal Island. Photo taken 01/14/07. 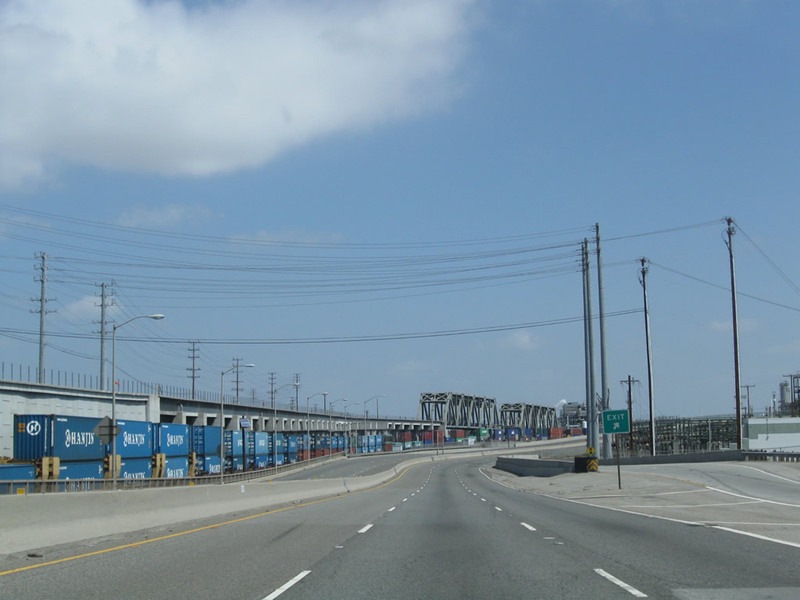 The Alameda Corridor is a north-south rail corridor that carries freight from the Ports of Los Angeles and Long Beach north to large railyards near downtown Los Angeles, where trains can carry freight north, northeast, and east to distant markets. 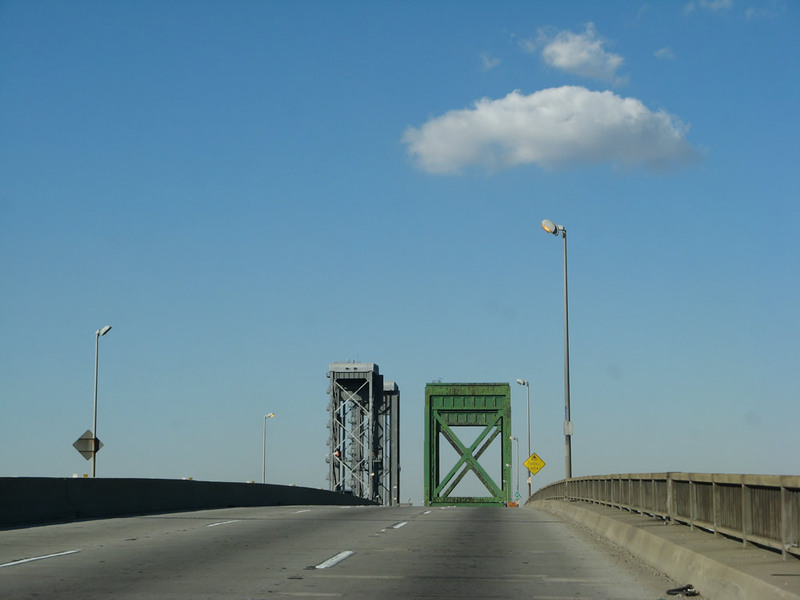 The railroad, which also crossed Cerritos Channel using a lift bridge, comes into view on an elevated track along the west side of California 47-103. Photo taken 01/14/07. 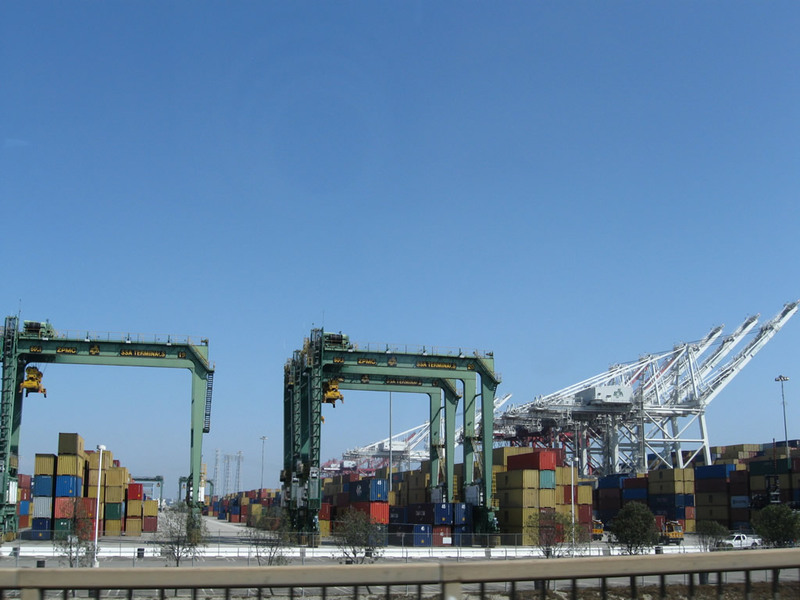 The Ports of Los Angeles and Long Beach feature massive container yards with towering cranes designed to lift cargo from ships and transfer them to holding areas until trucks or rail can take the freight to the appropriate market. Photo taken 07/13/09. 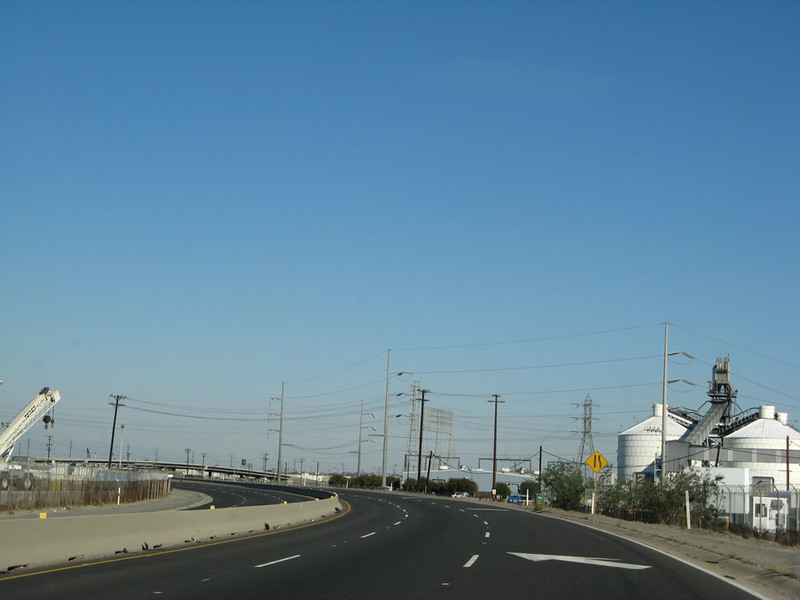 California 47 and California 103 split at Exit 4, Anaheim Street and Henry Ford Avenue. 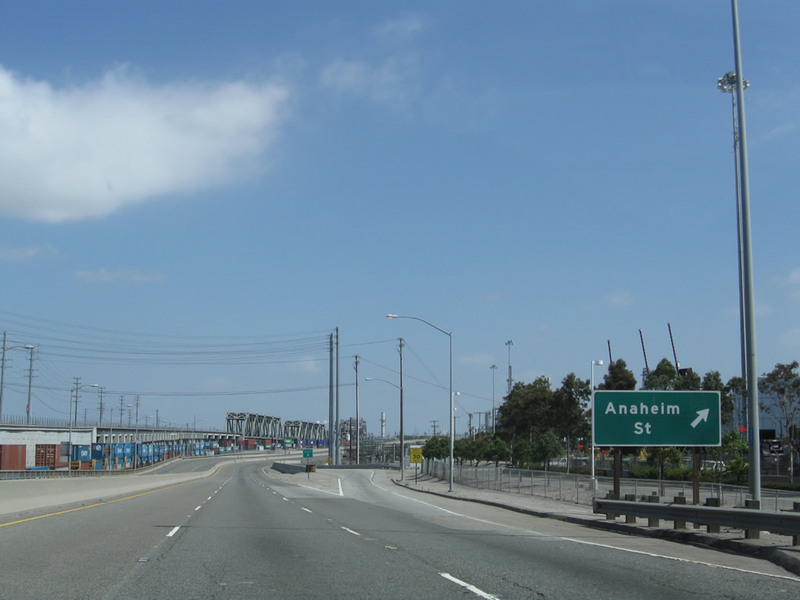 Although not signed here, California 47 departs the Terminal Island Freeway at the Anaheim Street exit to connect to Henry Ford Avenue and Alameda Street. 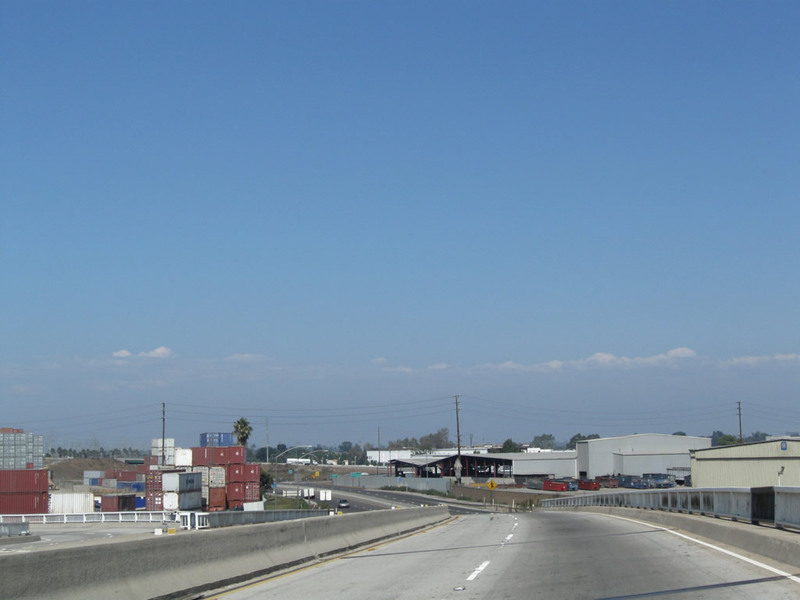 California 47 continues north along the Alameda Corridor (expressway) all the way to California 91. 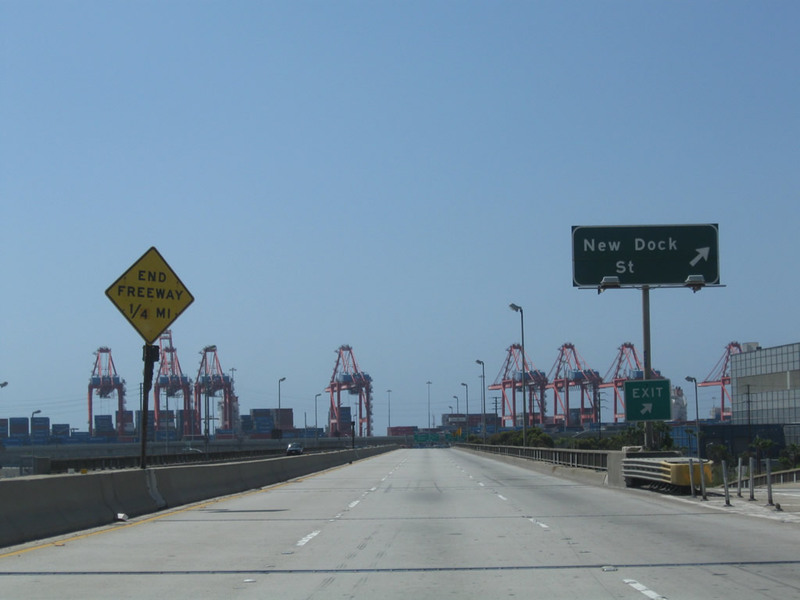 The left three lanes continue as the Terminal Island Freeway north as California 103 north. Photo taken 05/02/10. 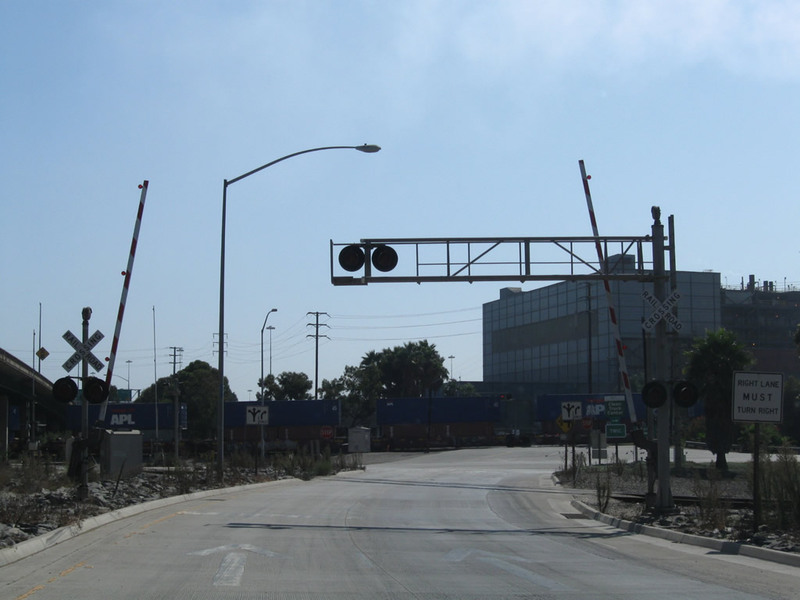 A below grade railroad comes into view below the above grade railroad at the gore point for Exit 4, Anaheim Street. 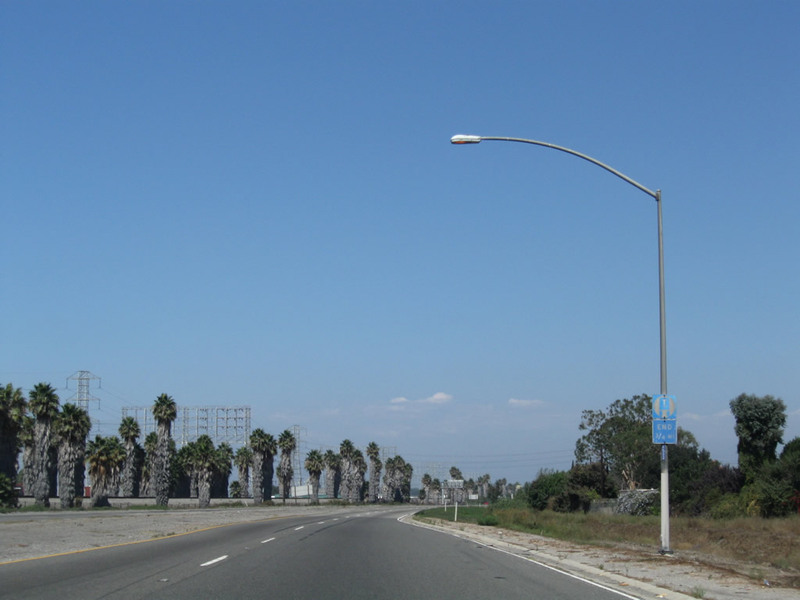 Continue north on the freeway by going to the California 103 page. Ahead, we'll follow Henry Ford Avenue north to Alameda Street. Photo taken 05/02/10. 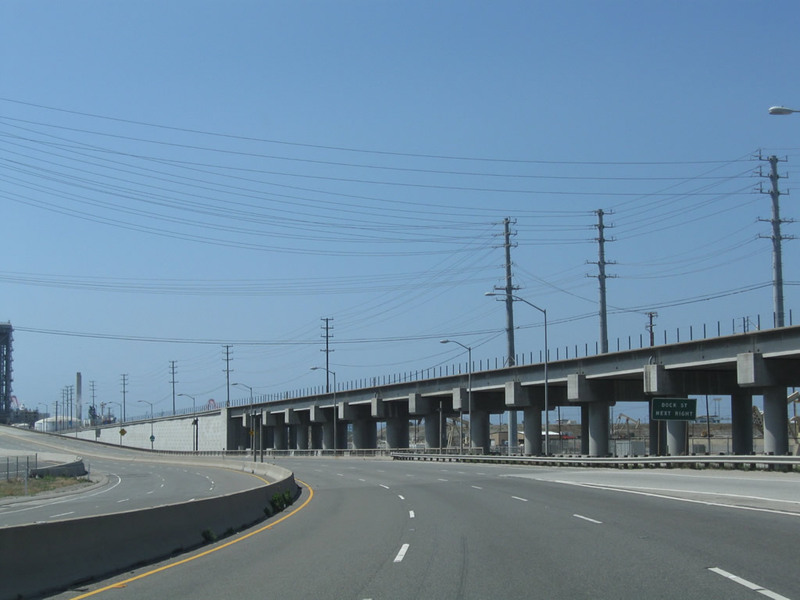 After California 47 departs from the Terminal Island Freeway at Exit 4 (Anaheim Street), California 103 (Terminal Island Freeway) continues with three northbound lanes. Photo taken 09/28/08. 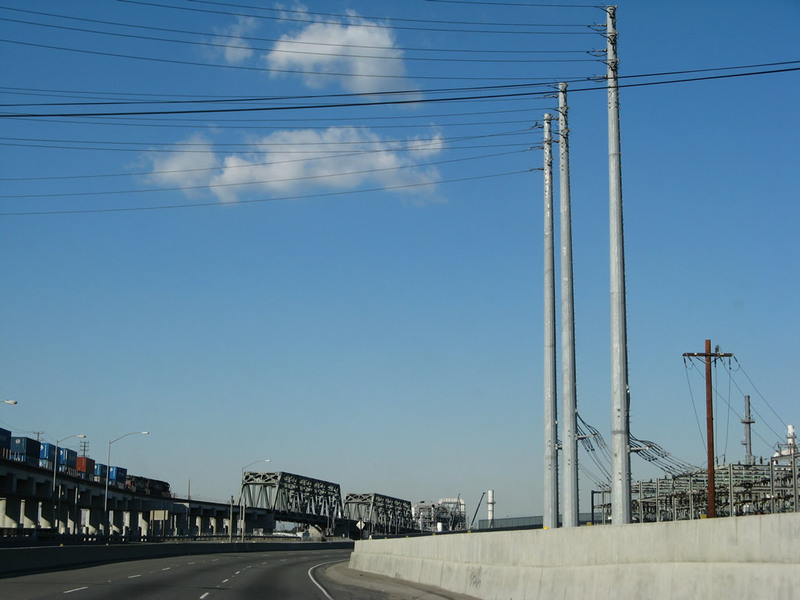 Tall power lines cross over the California 103 freeway as they cross over both the freeway and the elevated railroad adjacent to the freeway. Photo taken 09/28/08. 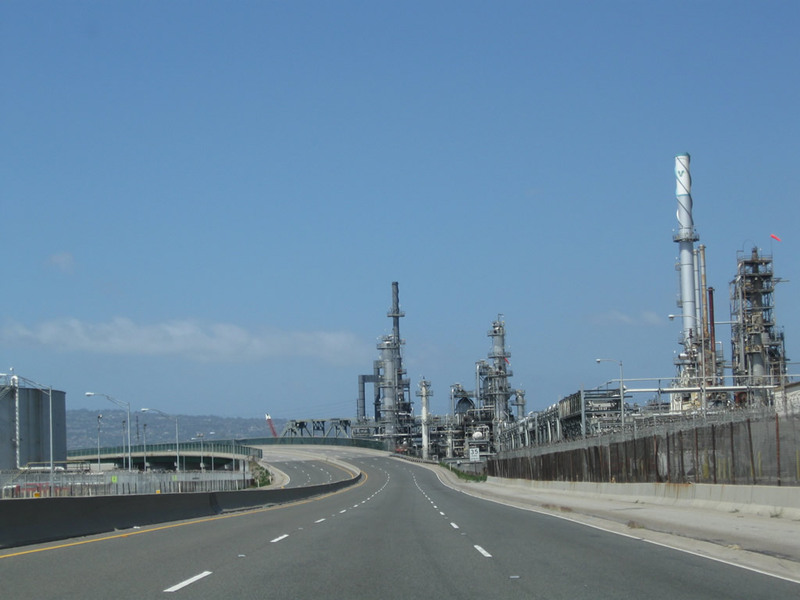 California 103 curves to the northeast as it approaches a chemical refinery. 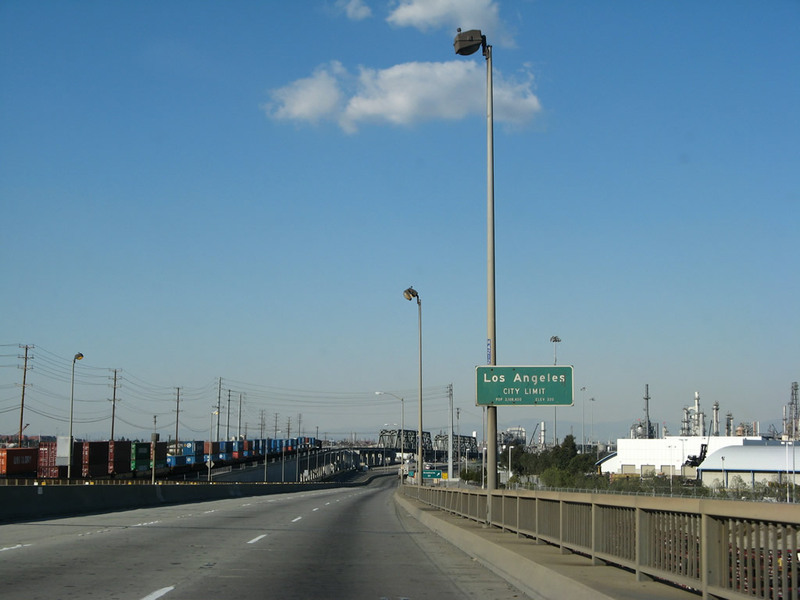 California 47, which had just departed from the freeway, follows Henry Ford Avenue underneath the freeway and the railroad tracks so it can join Alameda Street north alongside the major rail corridor leading north toward downtown Los Angeles and transcontinental railroads. 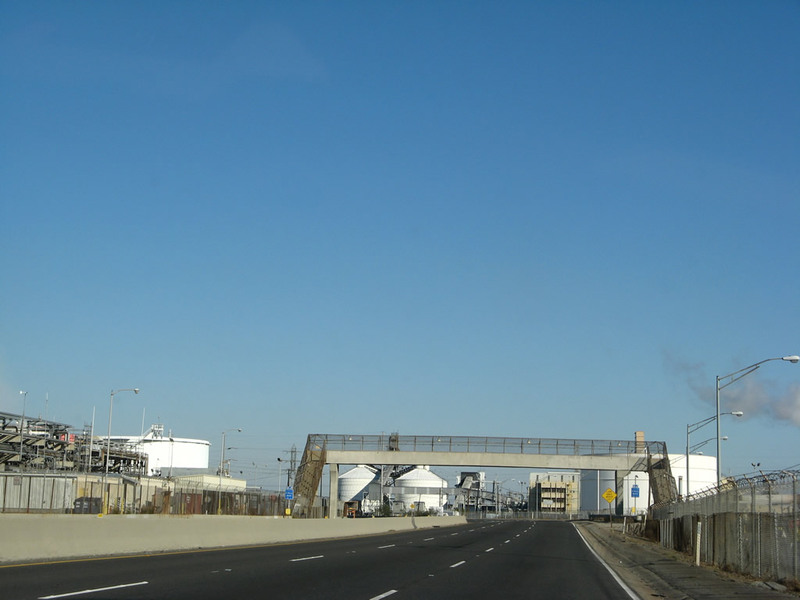 An expressway upgrade (part of the Port Access Expressway project) will modify the connection of both California 47 and California 103 through here. Photo taken 09/28/08. 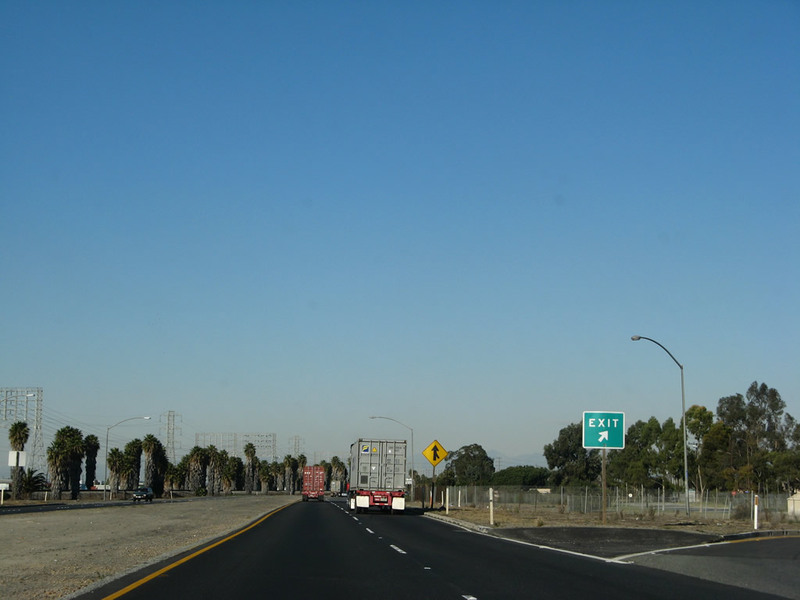 A begin California 103 shield is located at the point where the freeway turns northeast. 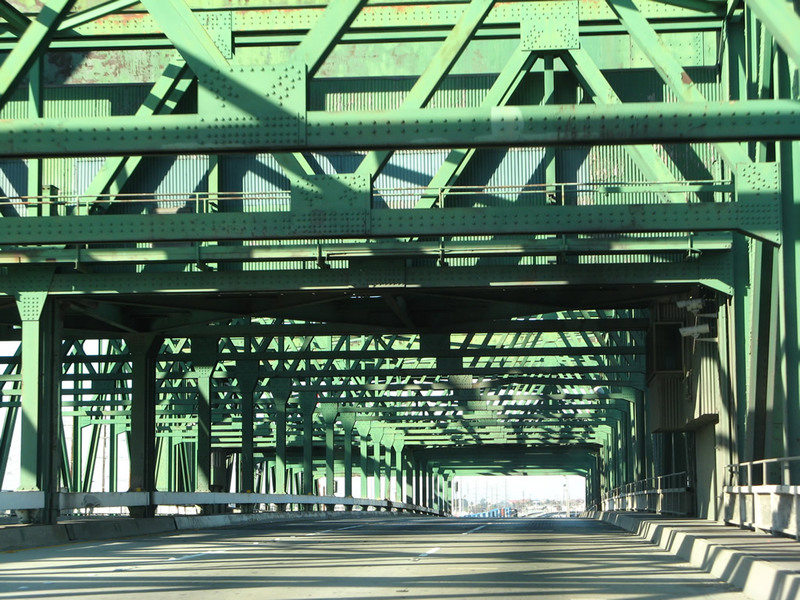 California 103 will continue as a freeway until it terminates prematurely at Willow Street. 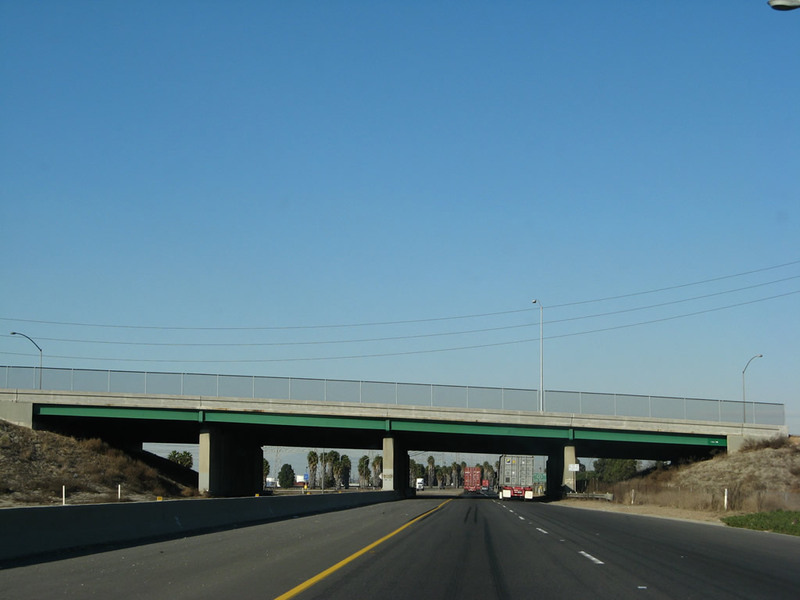 According to the California Streets and Highways Code, California 103 was originally proposed to extend northeast to connect directly with Interstates 405 and 710. 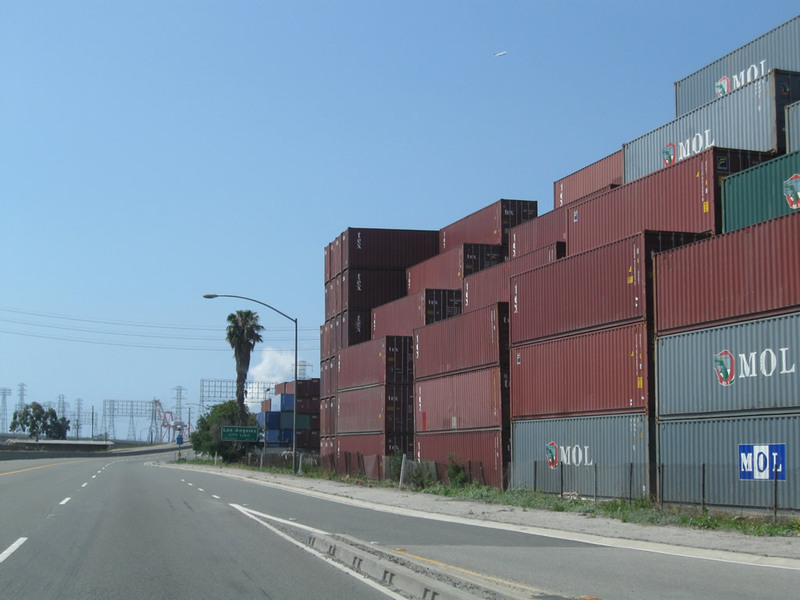 That connection has not been built, and with the Port Access Expressway project focusing on moving traffic toward the Alameda Corridor, it is unlikely California 103 would be extended anytime soon. Photos taken 09/28/08 and 07/21/01. 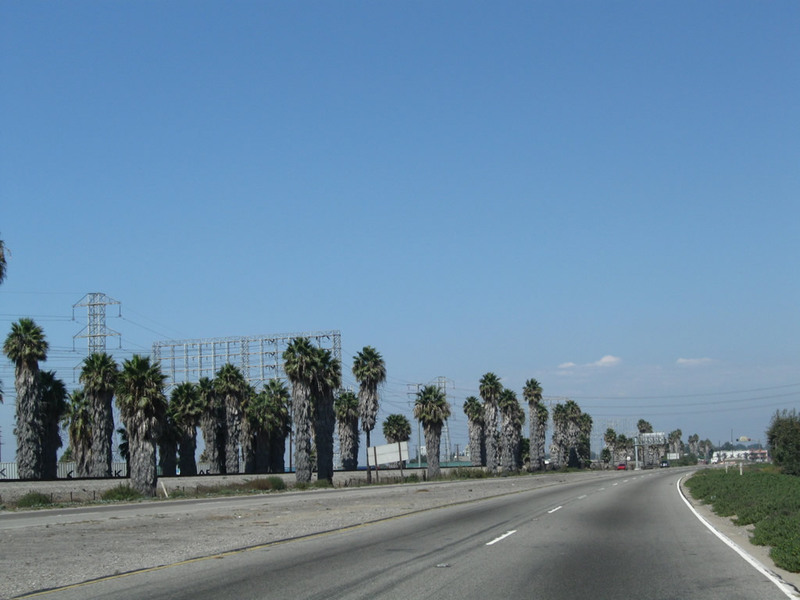 California 103 was built in 1947 and 1948, making this one of the region&apos; older freeways. The Union Pacific Overhead was built in 1947; it is a steel stringer/multi-beam/girder bridge. Photo taken 09/28/08. 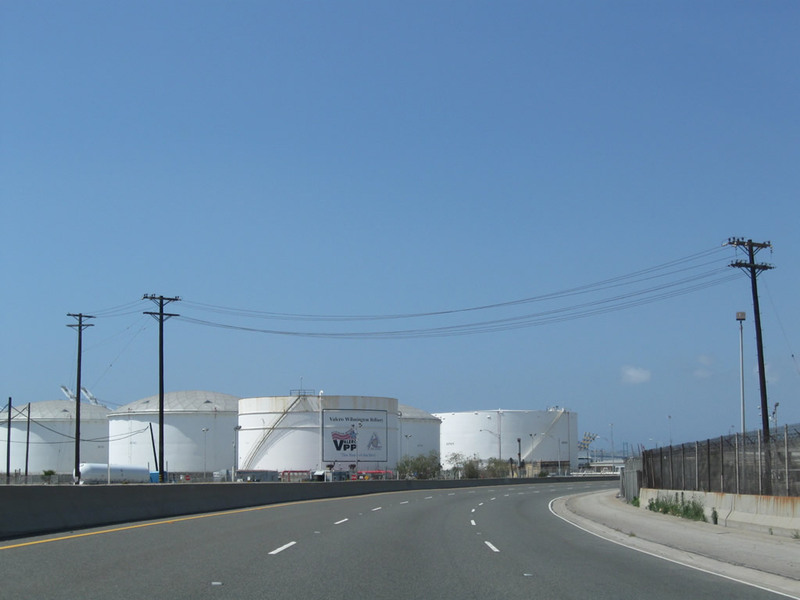 Curving northeast, California 103 avoids a large oil refinery that sits on the north side of the Terminal Island Freeway. 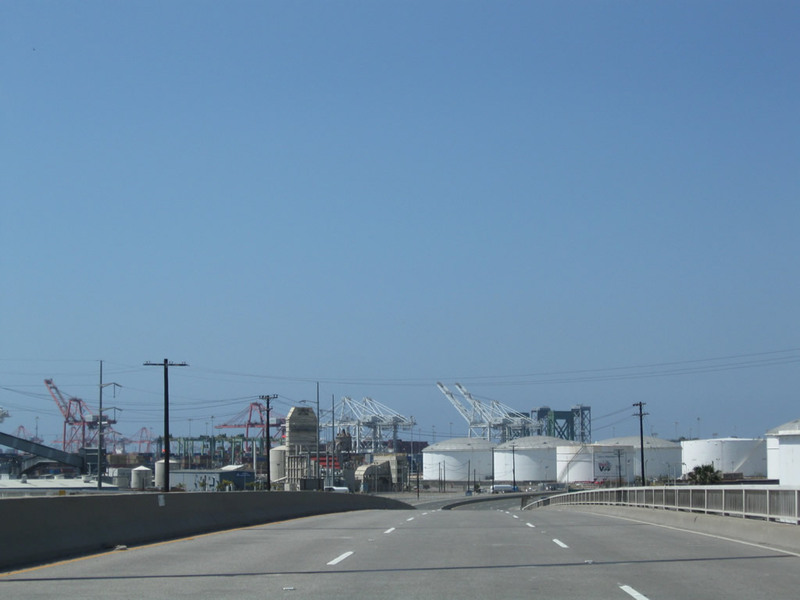 To the south of the freeway are more port-related industrial areas. Photos taken 01/14/07 and 09/28/08. 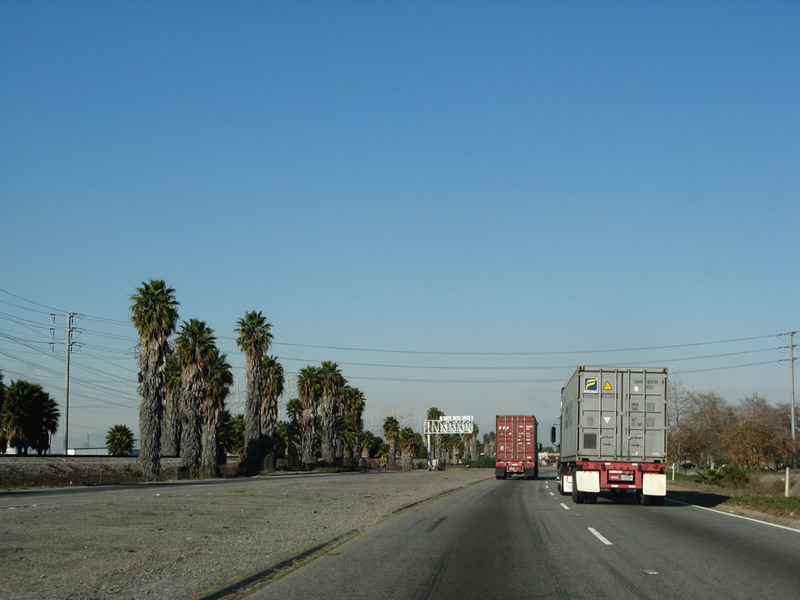 The speed limit on California 103 increases to 55 miles per hour. 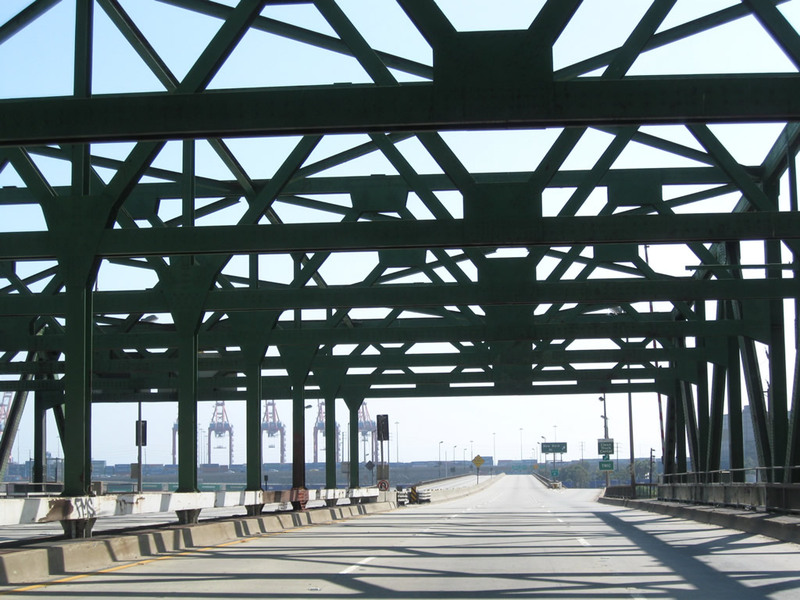 A 1981 pedestrian bridge (the Ultramar Pedestrian Overcrossing) passes over the freeway. Photos taken 01/14/07 and 09/28/08. 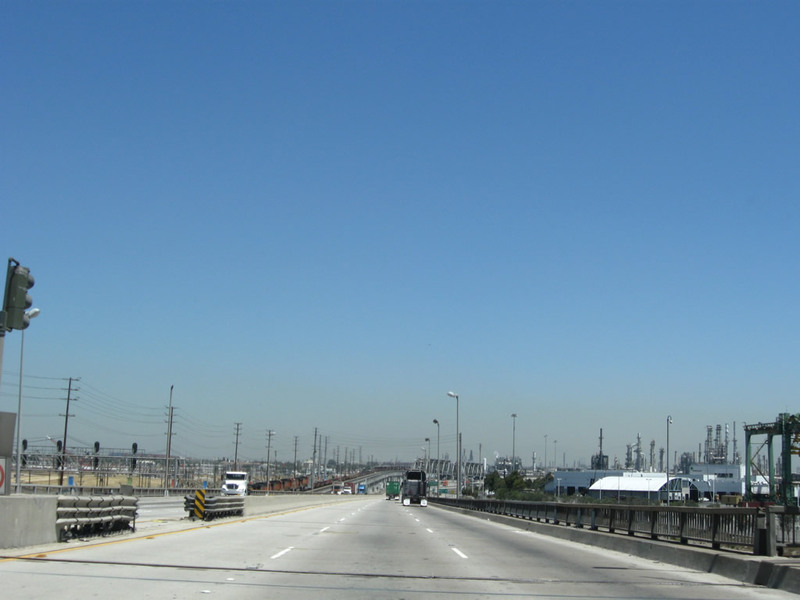 California 103 curves back to the north as it passes between the refineries and industrial areas. 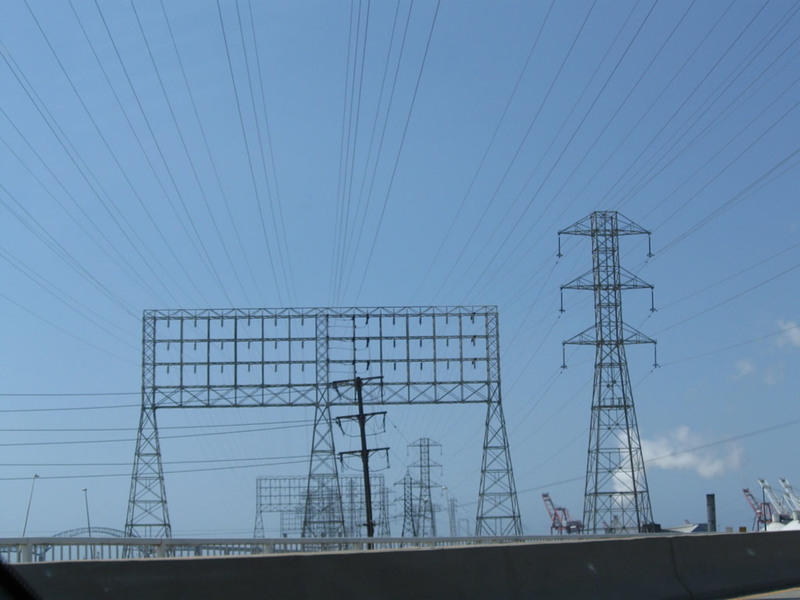 Power lines intercept the freeway and parallel it briefly, supplying electricity to this massive facility. Photos taken 01/14/07 and 09/28/08. 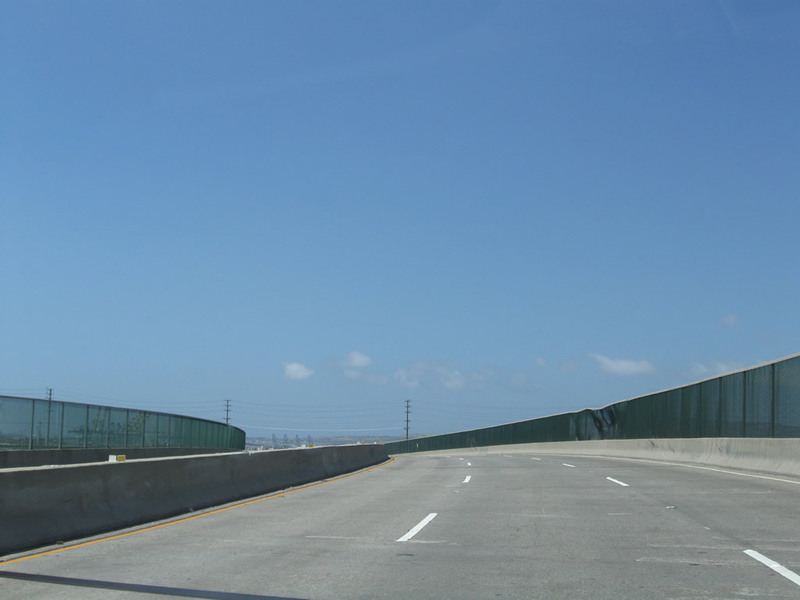 After the curve, northbound California 103 narrows to two lanes. Photo taken 09/28/08. 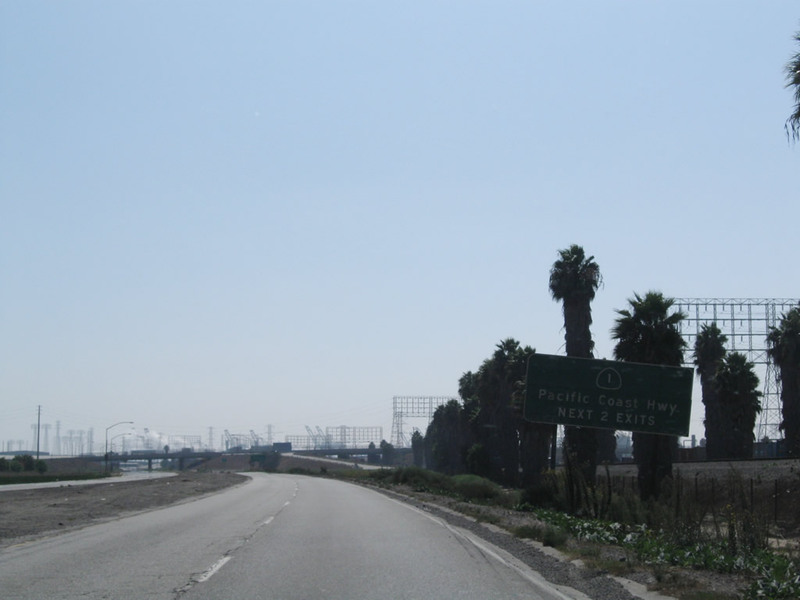 The first and only standalone interchange along California 103 (Terminal Island Freeway) is Exit 1, California 1 (Pacific Coast Highway). 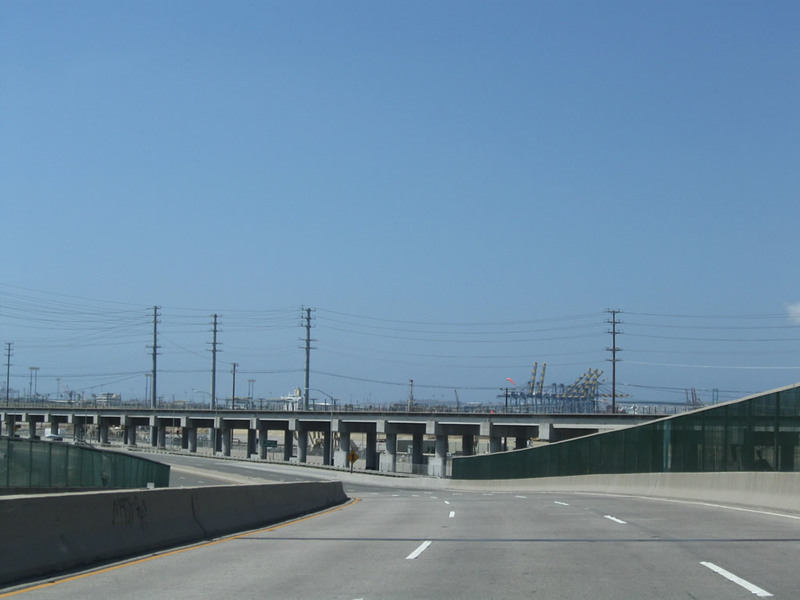 Between Torrance and Long Beach, California 1 runs east-west, thus allowing for this interchange between the north-south freeway and the coast highway. Photo taken 09/28/08. 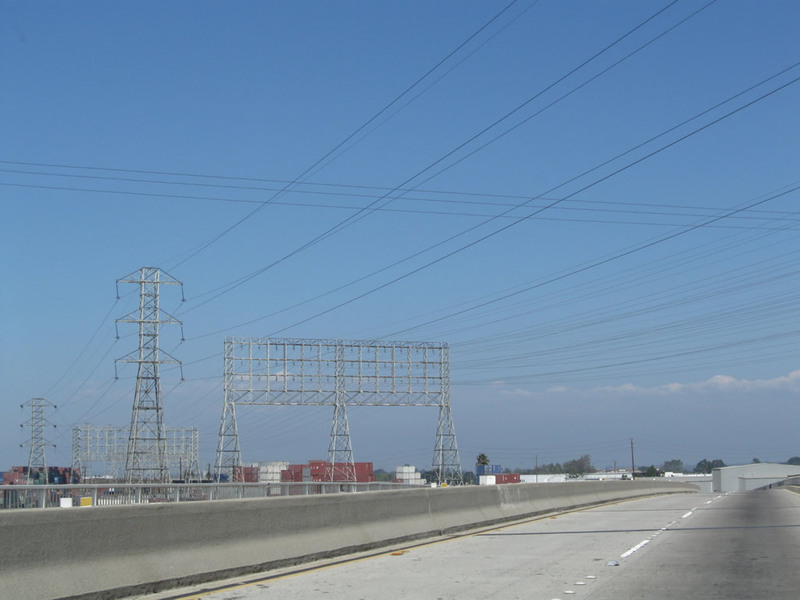 Towering Southern California Edison power lines (including an incredible 12-circuit 69kV tower) cross over California 103 as the freeway again mounts an overpass built in 1947 (Anaheim Street overcrossing). 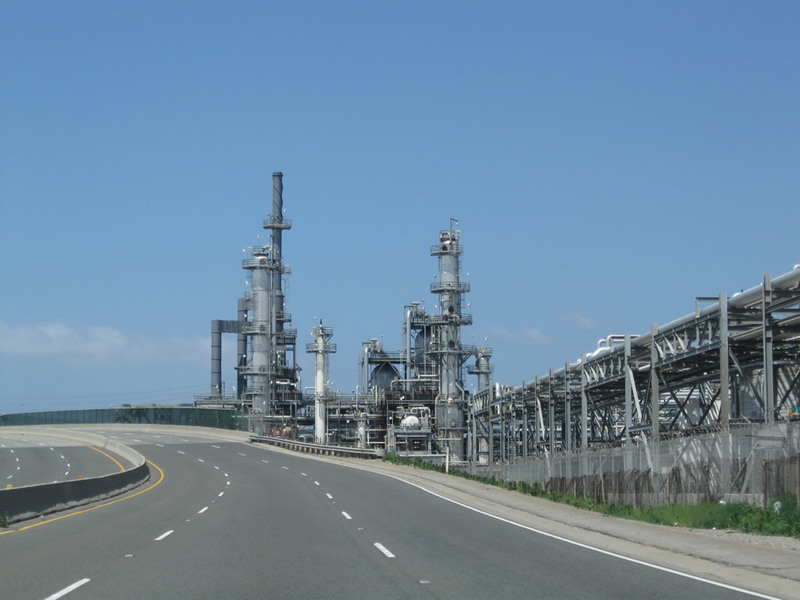 Leaving the oil refinery behind, we see more container stock and tons of stored cargo making its way to and from the port areas. Photos taken 01/14/07, 09/28/08, 07/13/09, and 05/02/10. After the viaduct touches down again, a postmile marker is painted on the median wall. Photo taken 09/28/08. 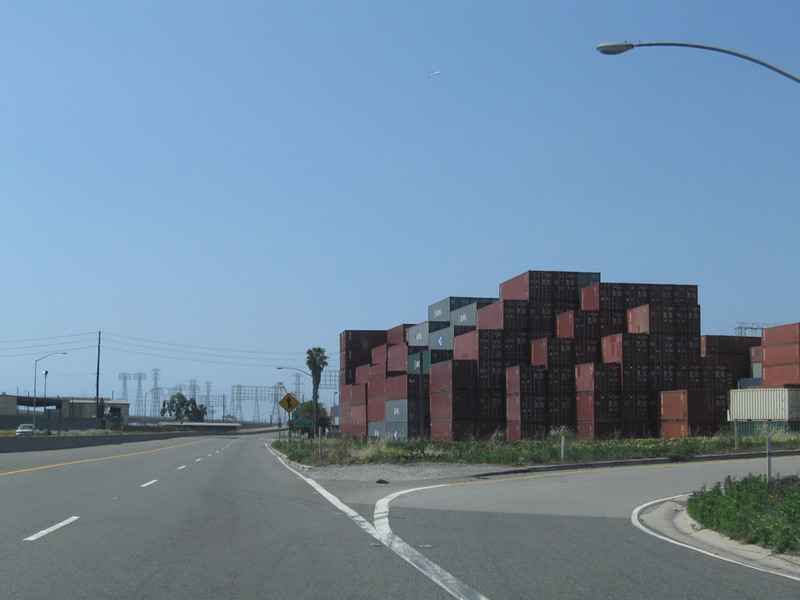 Towering container stock piles close to the freeway, while an on-ramp from Anaheim Street joins California 103 north. Photo taken 07/13/09. 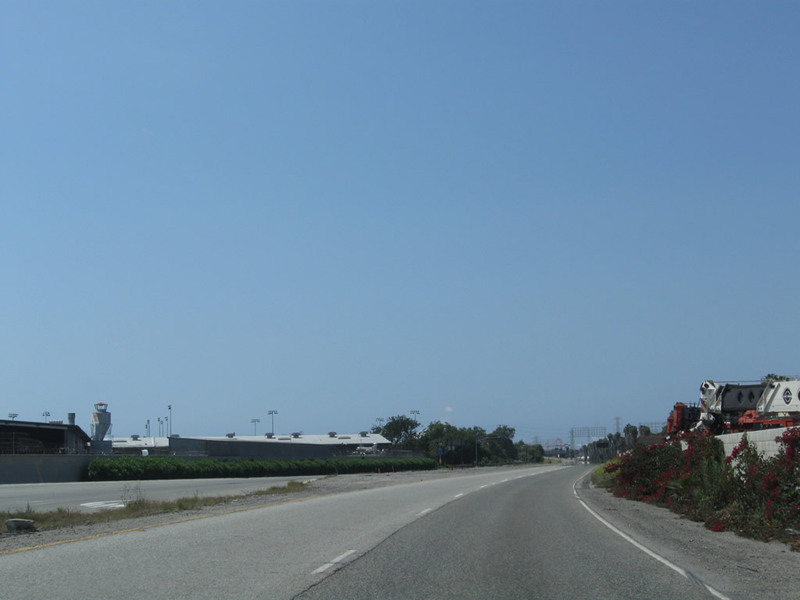 Northbound California 103 approaches the cloverleaf interchange with California 1 (Pacific Coast Highway). 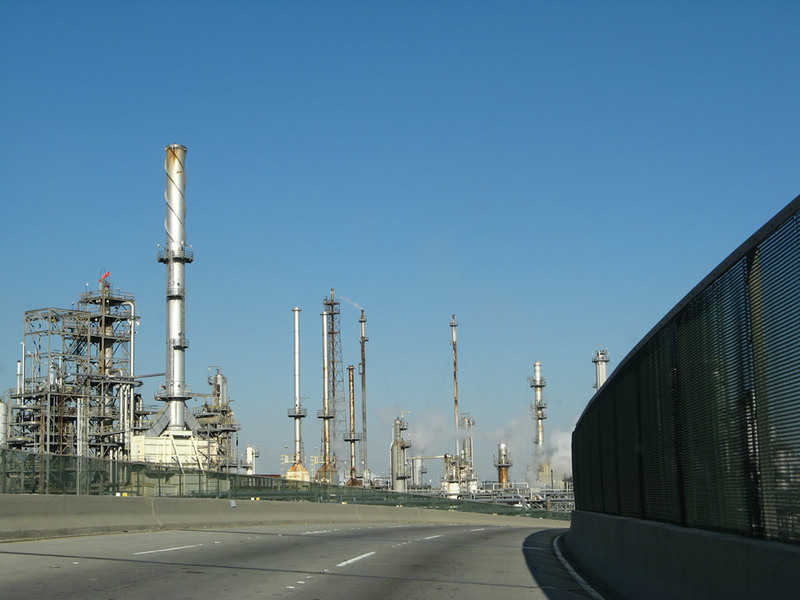 Take California 1 north (west) toward Carson and Torrance or south (east) toward Long Beach and Seal Beach. 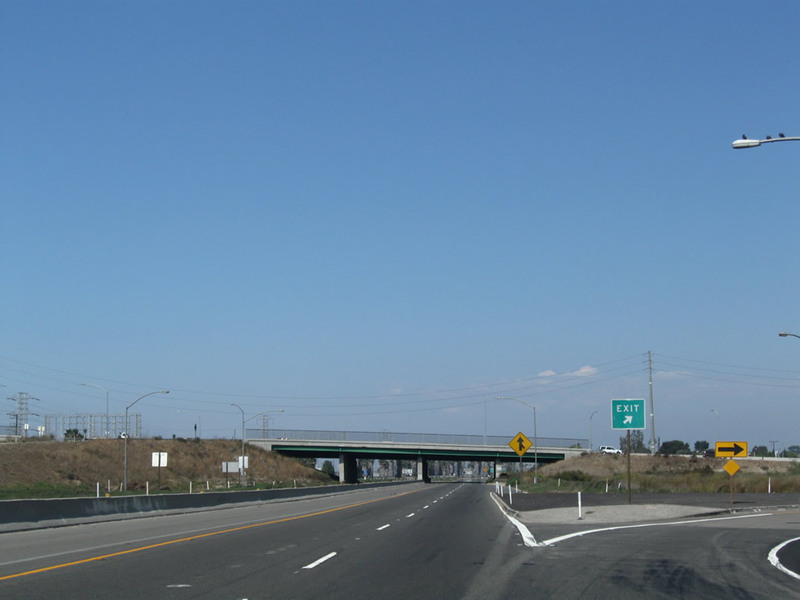 The first ramp (Exit 1A) connects to California 1 south, while the second ramp (Exit 1B) loops to California north. Photo taken 07/13/09. 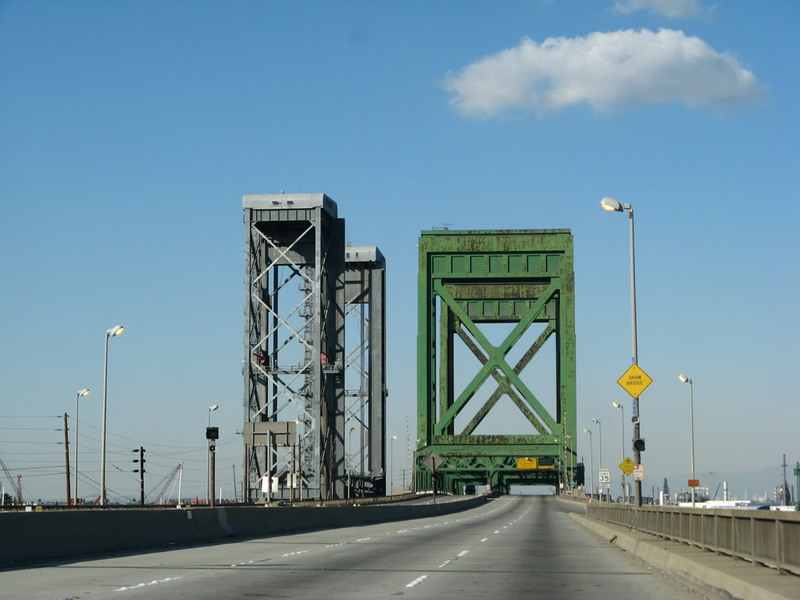 California 103 leaves the city of Los Angeles and reenters Long Beach for the first time since the Heim Bridge crossing (concurrent with California 47). Photo taken 01/14/07. 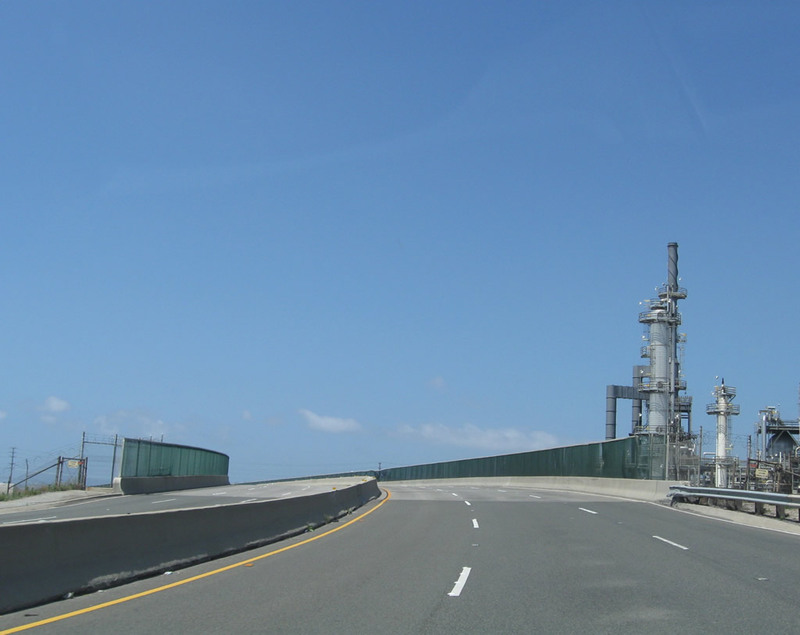 Northbound California 103 meets Exit 1A, California 1 (Pacific Coast Highway) south to Long Beach, Seal Beach, and points south along the Orange County coastline. Photo taken 07/13/09. 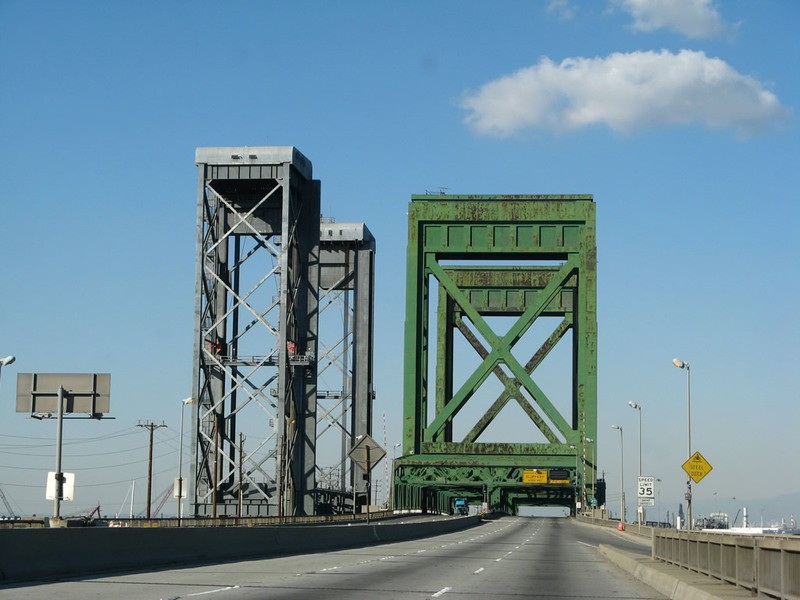 Built in 1948, the structure carrying California 1 over California 103 is another steel stringer/multi-beam/girder bridge. Photo taken 01/14/07. 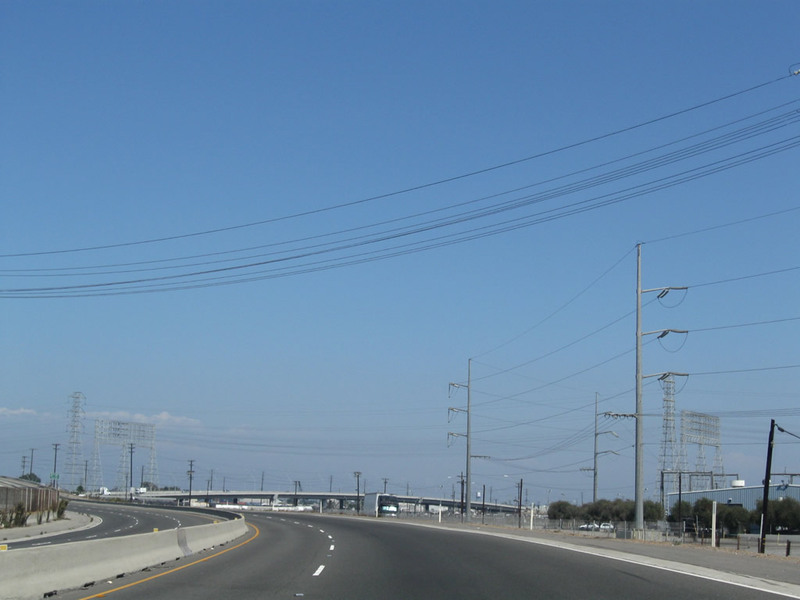 As the aforementioned Southern California Edison power lines parallel California 103, the next off-ramp from California 103 north connects to Exit 1B, California 1 north to Santa Monica (and many other beach communities along the way). Photo taken 07/13/09. 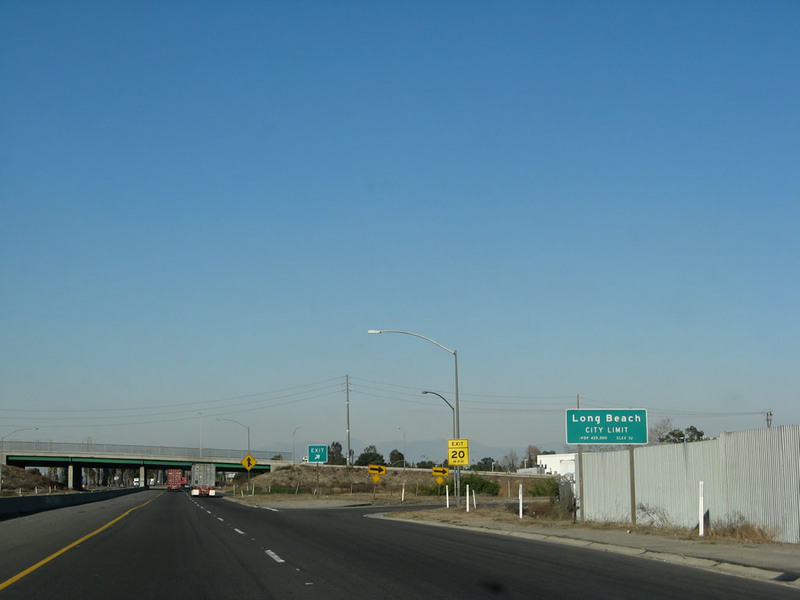 A California 1 trailblazer is posted prior to the off-ramp to California 1 north. Ahead, California 103 proceeds north for the final distance to Willow Street. Photo taken 07/13/09. 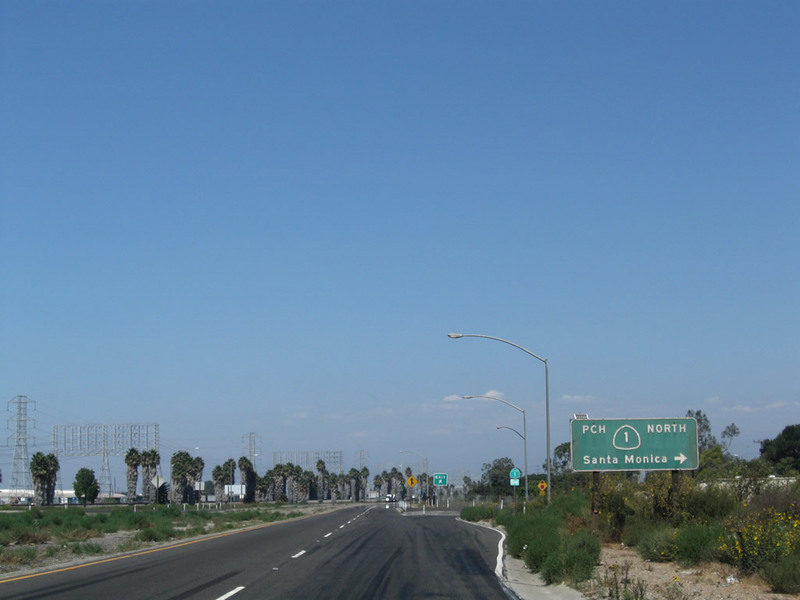 Northbound California 103 (Terminal Island Freeway) reaches Exit 1B, California 1 north to Santa Monica. Photo taken 01/14/07. 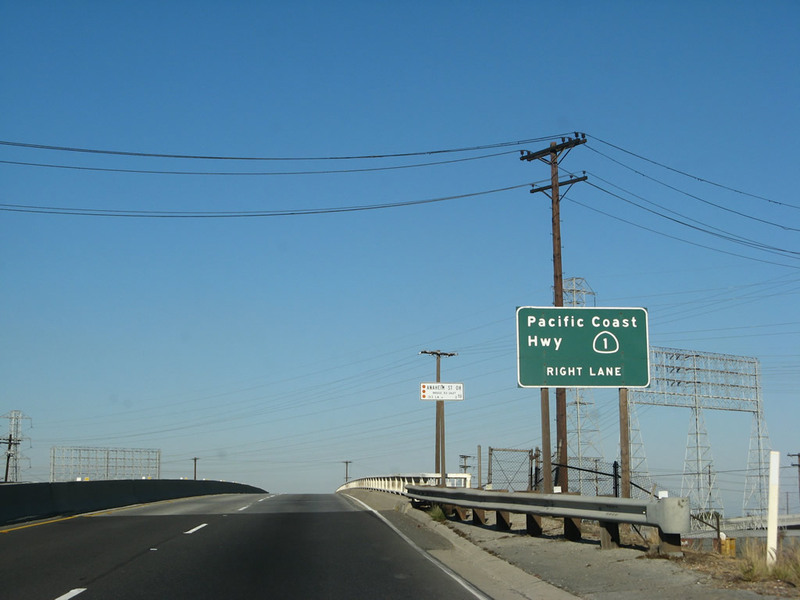 Leaving the vicinity of the California 1 (Pacific Coast Highway) interchange, northbound California 103 proceeds north as a freeway for about three-quarters of a mile before ending at Willow Street in Long Beach. 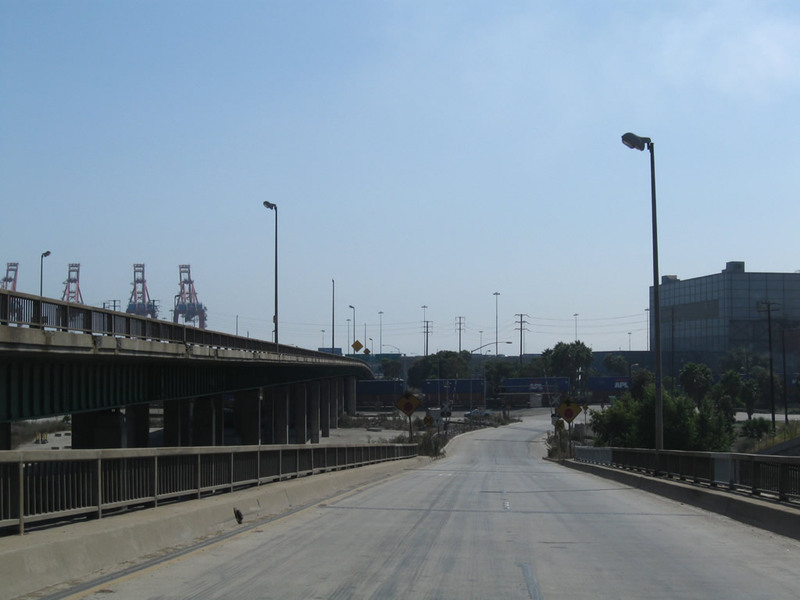 This four-lane freeway is underutilized and does not carry much traffic. 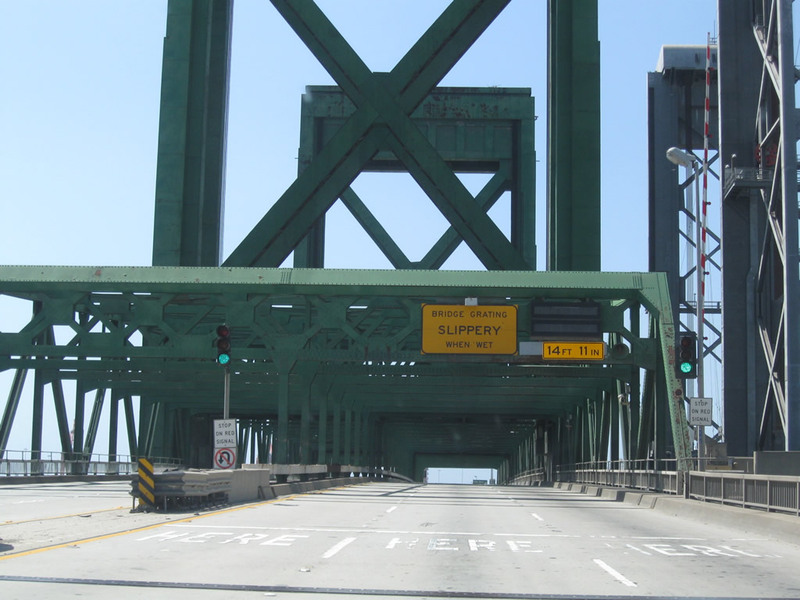 Maintenance of this section of California 103 is conducted by the city of Long Beach. 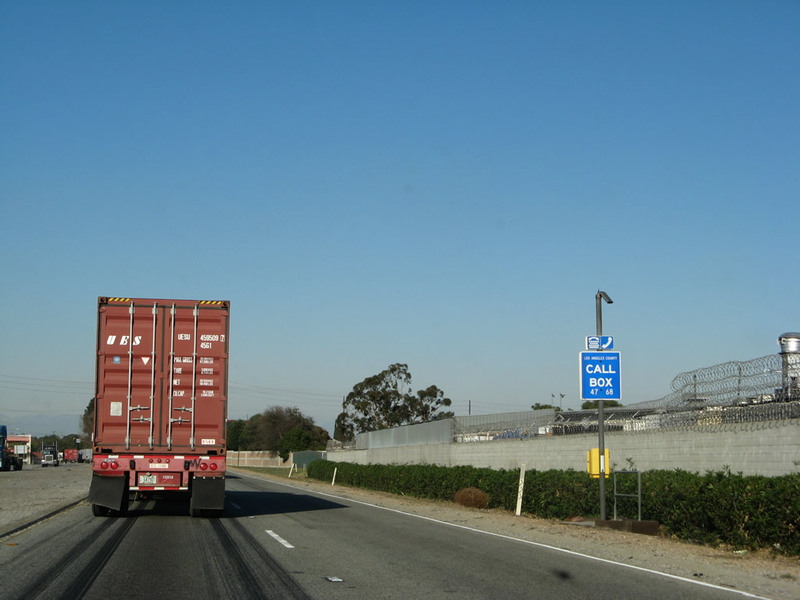 A reassurance shield for California 103 north, along with the truck route ending sign, would be appropriate here but is not posted. Photo taken 07/13/09. On some days, California 103 can be empty with no traffic. 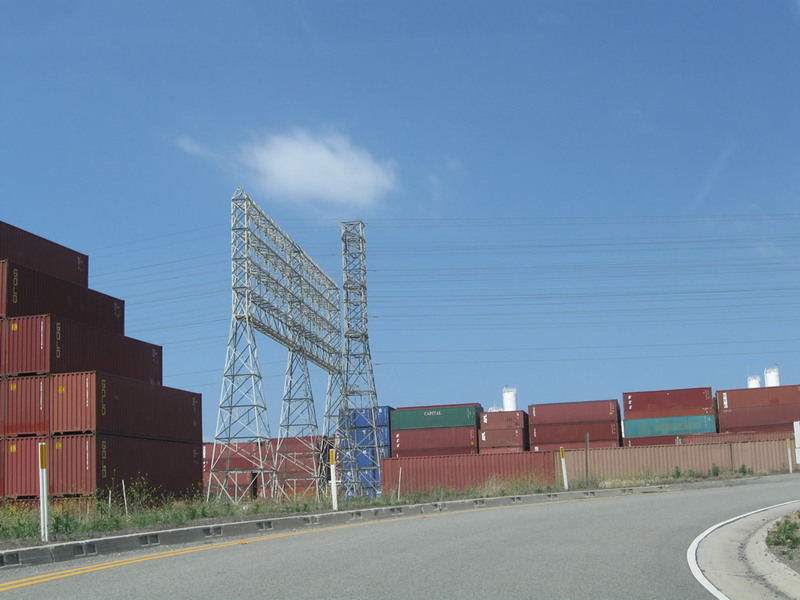 On other days, it can be very busy with ample commercial and truck traffic. Photos taken 07/13/09 and 01/14/07. 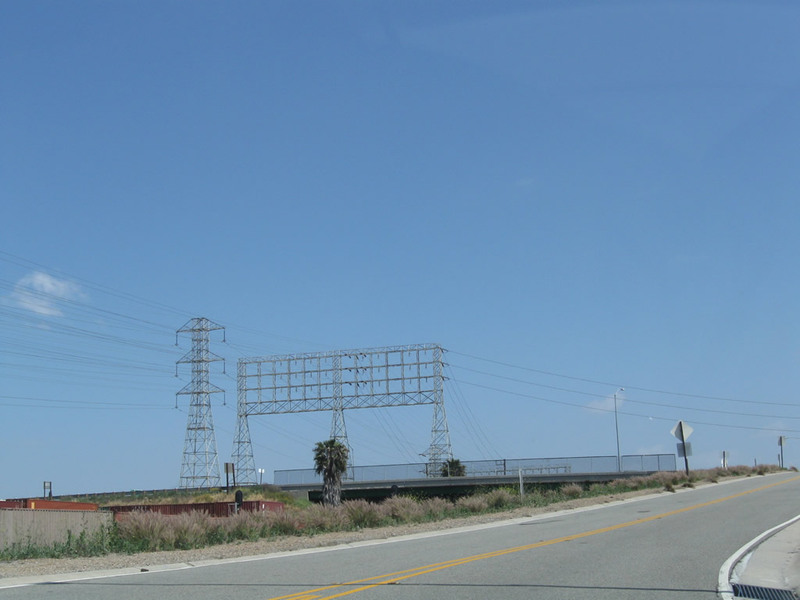 An end freeway sign is posted along northbound California 103 about a half-mile south of the Willow Street intersection. 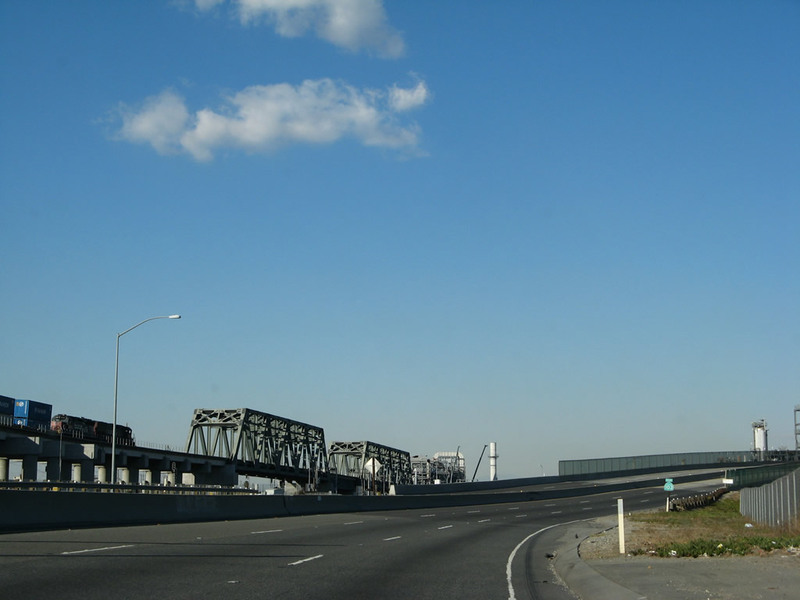 California 103 was originally intended to continue northeast to meet Interstate 405 and Interstate 710 at their current interchange; that plan is still on the books but remains unconstructed. Photo taken 07/13/09. 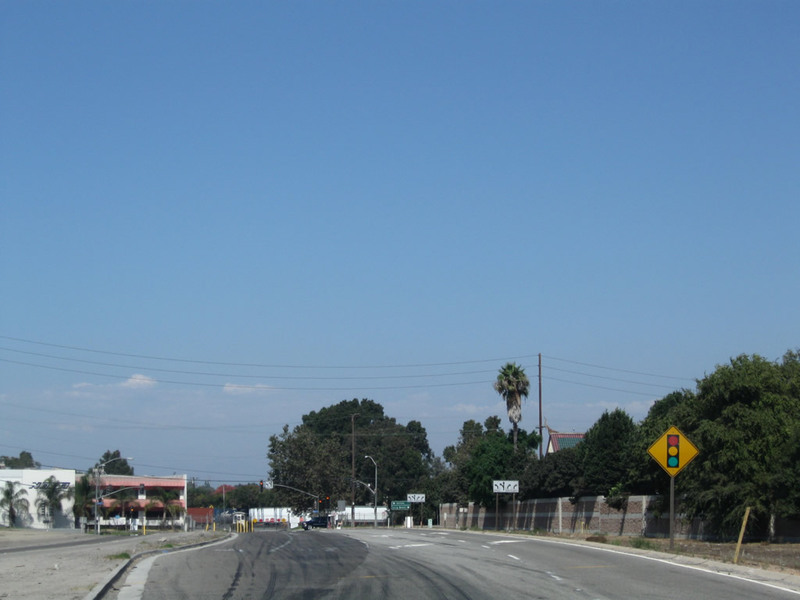 Northbound California 103 approaches its end at Willow Street (a left turn on Willow Street will connect to Los Angeles' famed Sepulveda Boulevard). Photo taken 07/13/09. 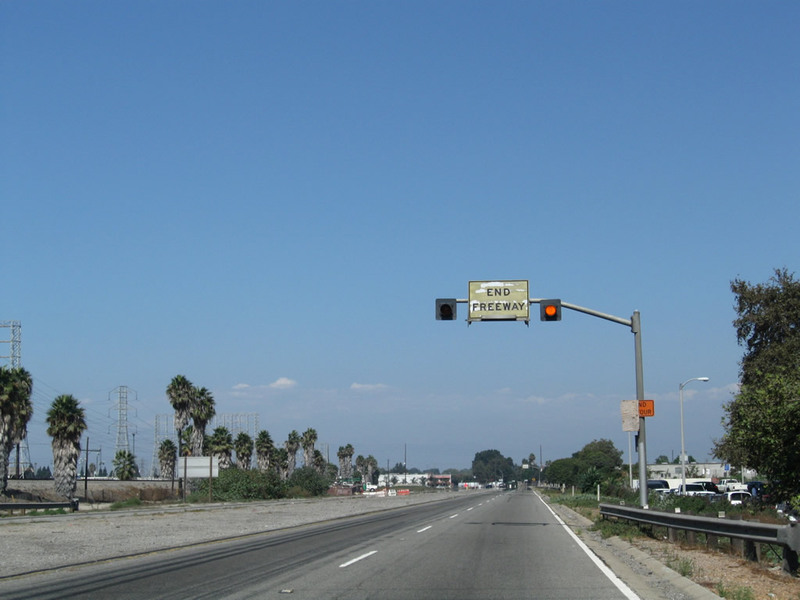 A call box implying that this section of freeway is part of California 47 was still in place as of 2007 but was gone by 2009. Photo taken 01/14/07. 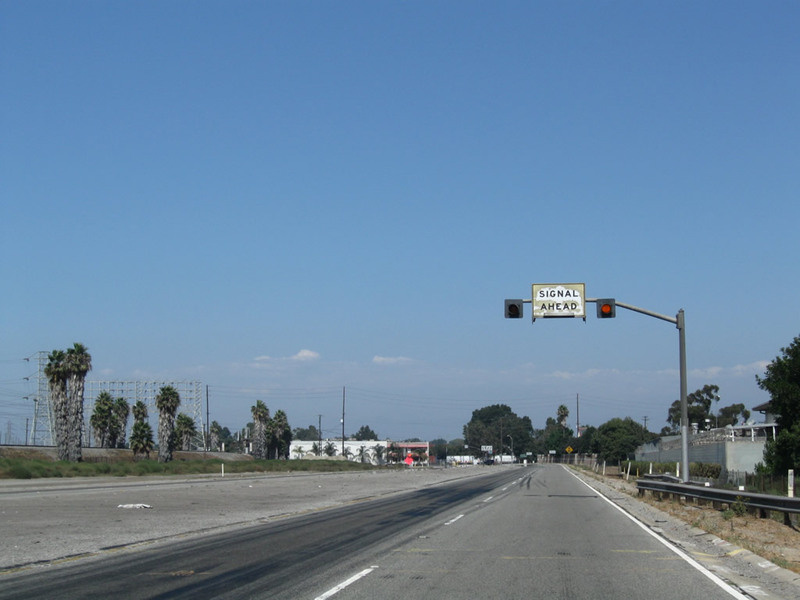 Northbound California 103 meets Willow Street at this traffic signal; this is the northern terminus of the state route. 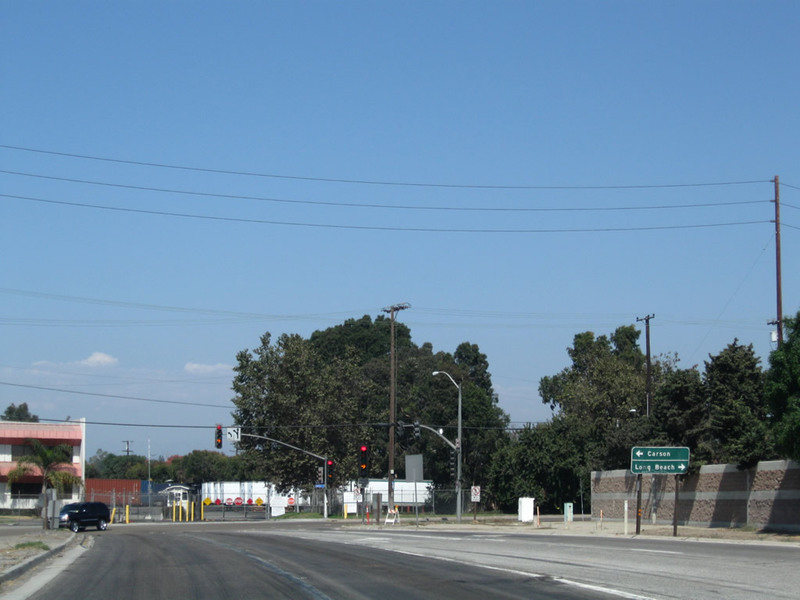 Turn left to follow Willow Street to Sepulveda Boulevard and the city of Carson. Turn right to follow Willow Street into Long Beach. A private driveway continues straight ahead, so don't continue straight through the traffic signal. No end route marker is posted for California 103. Photos taken 07/13/09. 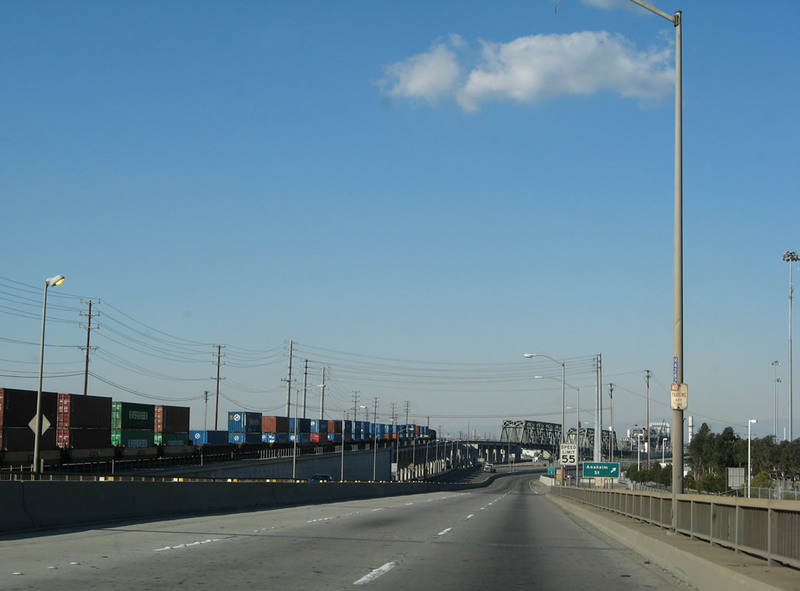 California 103 (Terminal Island Freeway) begins as a four-lane freeway. 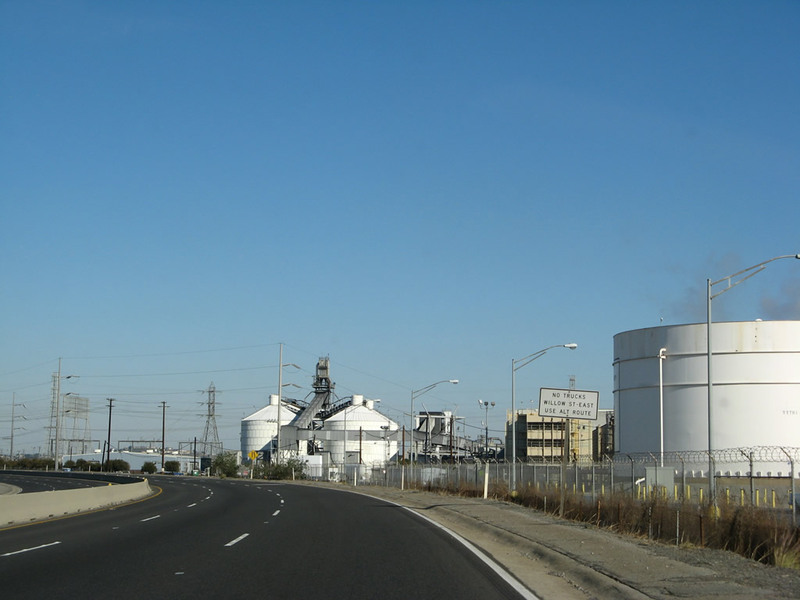 Constructed in 1947 and 1948, it features older highway design, most obvious at California 1 cloverleaf interchange and at the viaducts near the refineries south of the California 1 interchange. Photo taken 05/02/10. 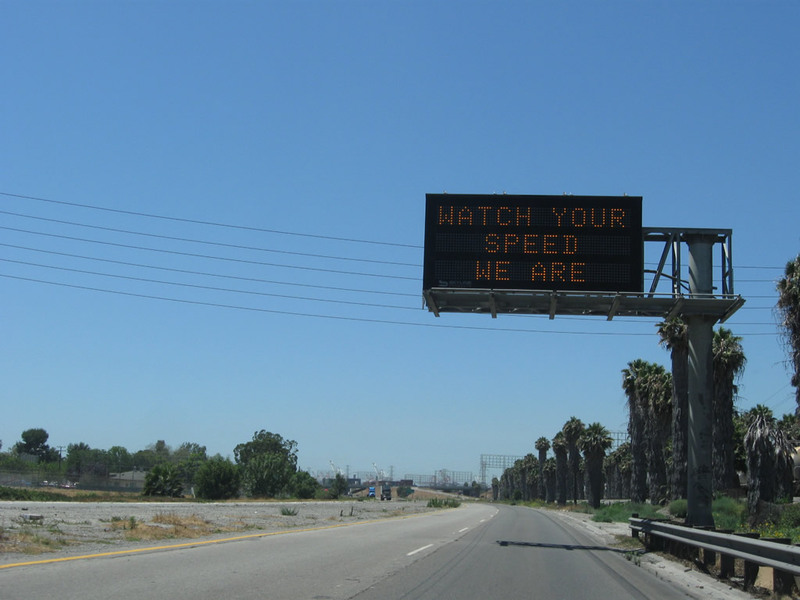 A dynamic message sign is posted on California 103 south between Willow Street and California 1. Photo taken 07/13/09. 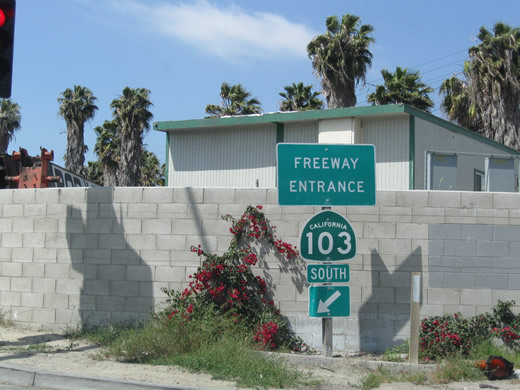 The first two exits from California 103 south are Exits 1D-C, California 1 (Pacific Coast Highway) north and south. This sign was gone by 2009. Photo taken 09/28/08. 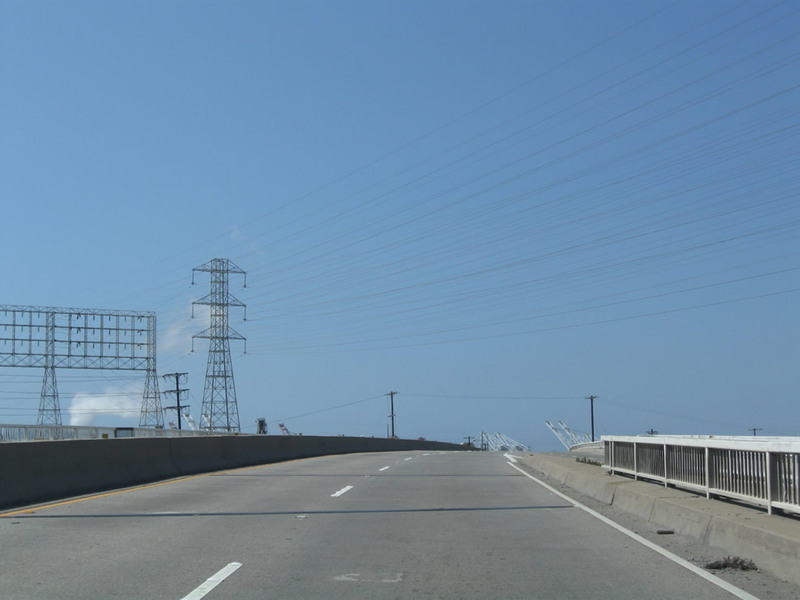 Southbound California 103 (Terminal Island Freeway) reaches Exits 1D, California 1 (Pacific Coast Highway) north to Santa Monica. 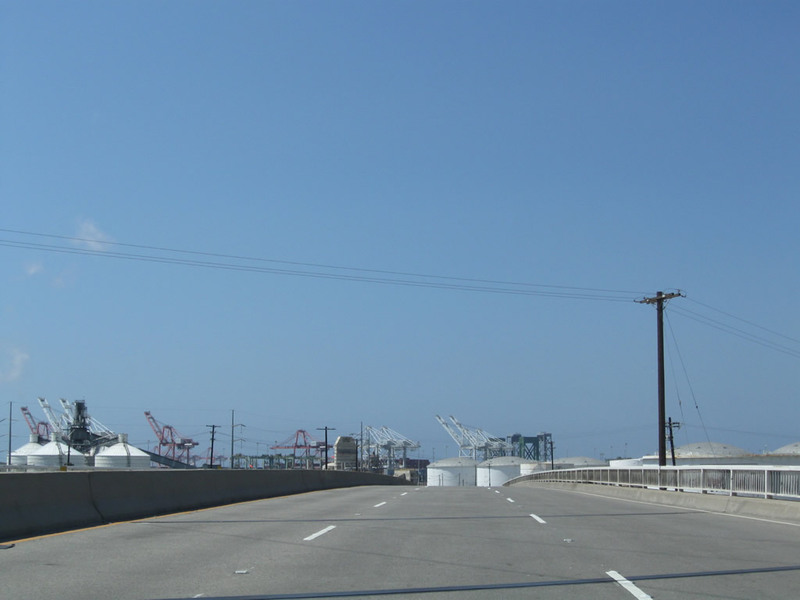 The next ramp connects to Exit 1C, California 1 south to Long Beach and Seal Beach. Photo taken 07/13/09. 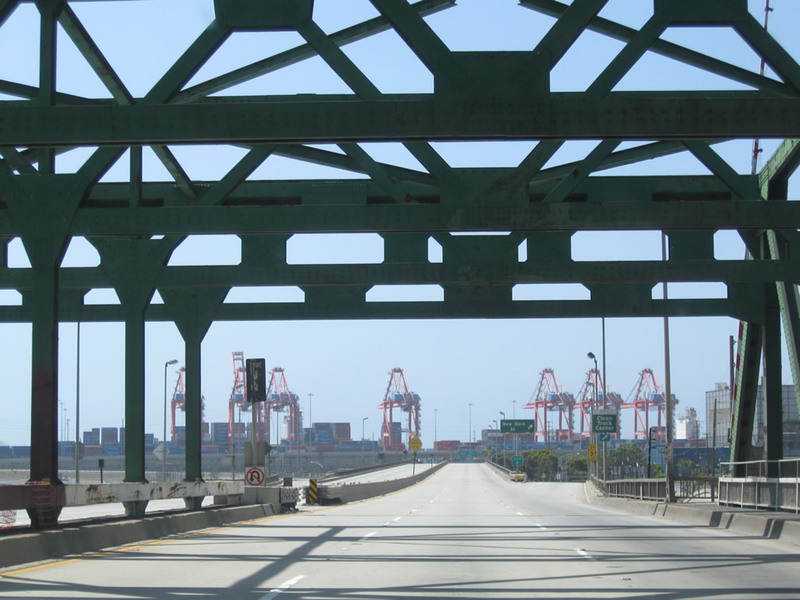 Southbound California 103 (Terminal Island Freeway) passes under California 1 (Pacific Coast Highway). 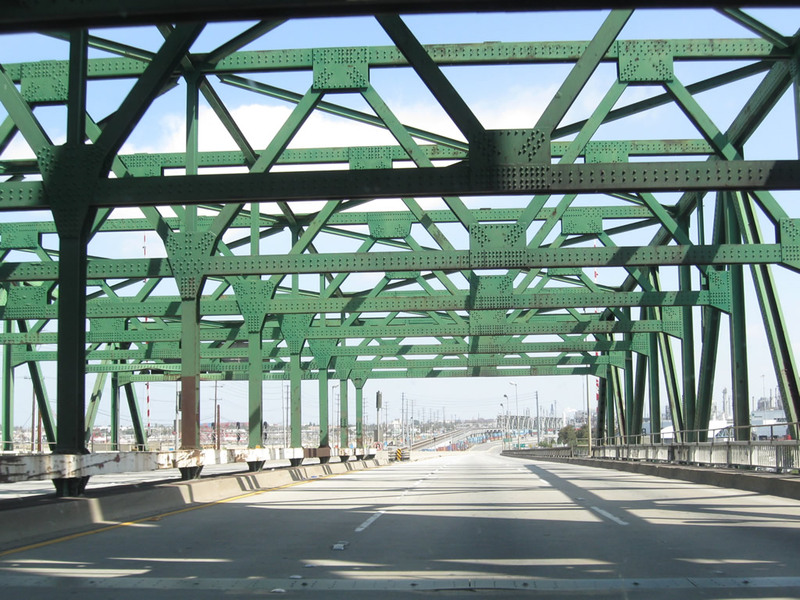 The PCH crosses over the Terminal Island Freeway via a 1948 bridge. Photo taken 05/02/10. 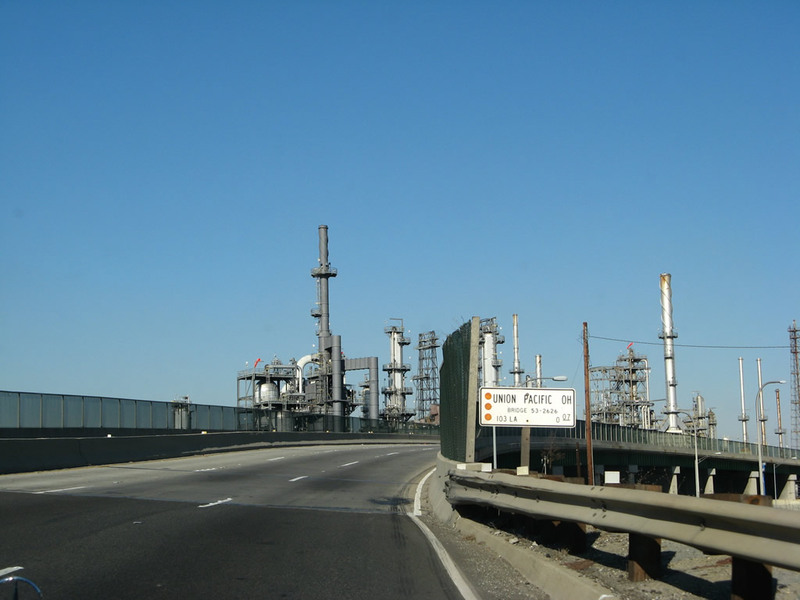 Southbound California 103 (Terminal Island Freeway) reaches Exit 1C, California 1 (Pacific Coast Highway) south (east) to Long Beach. Photo taken 05/02/10. No EXIT gore point sign was present at the time this picture was taken. Photo taken 05/02/10. 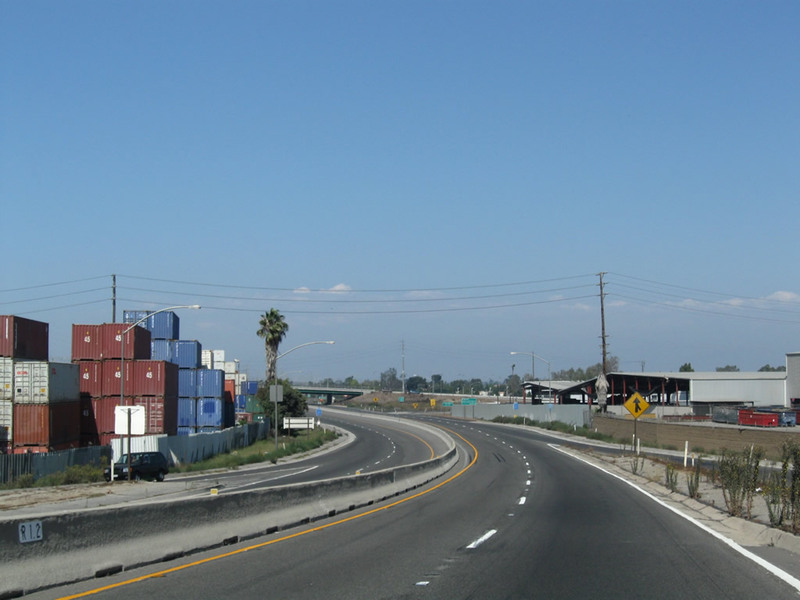 On the transition ramp between California 103 south and California 1 south, a large stack of cargo containers dominate the view of the southwest quadrant of this cloverleaf interchange. At the top of the loop ramp is older divoted curbing dating back to original construction in 1948. Photos taken 05/02/10. 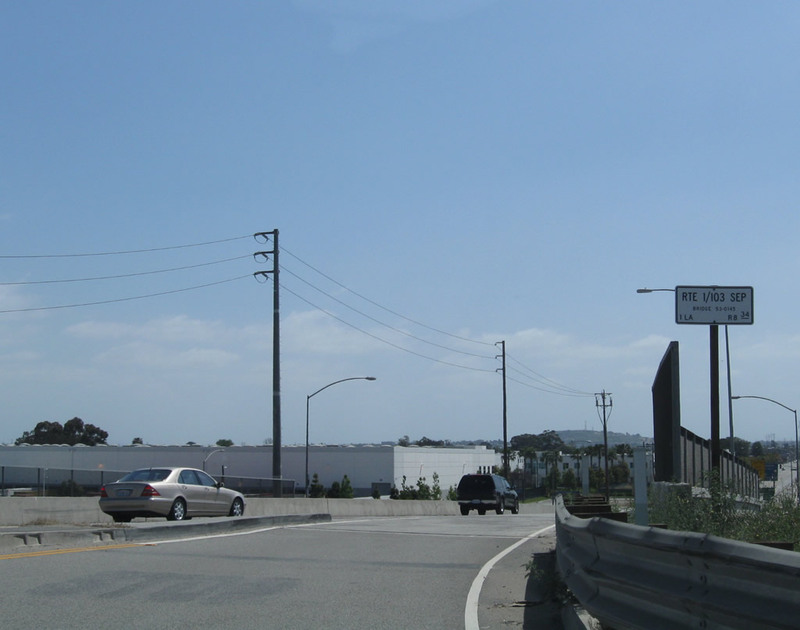 Divoted curbing appears along the Terminal Island Freeway mainline. 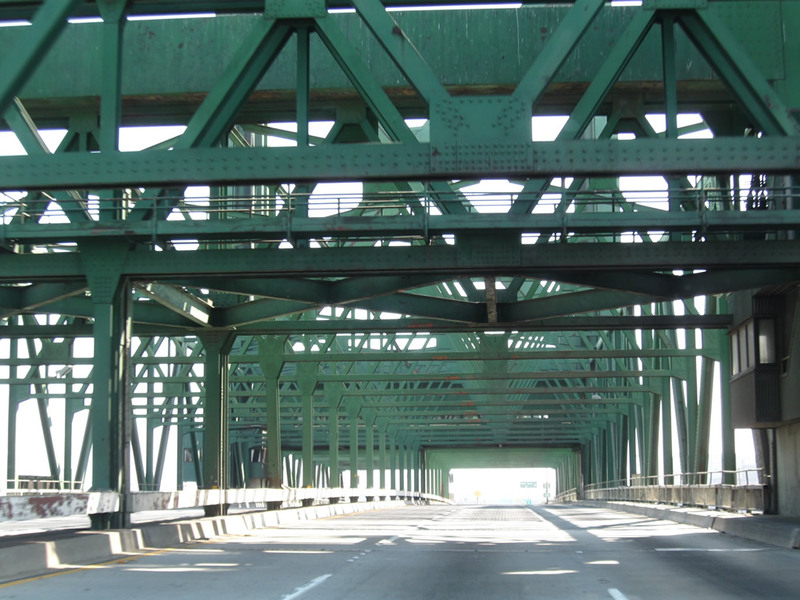 This was a common design element to freeways and state routes built in the late 1940s but is rarely used in today&apos;s design standards. 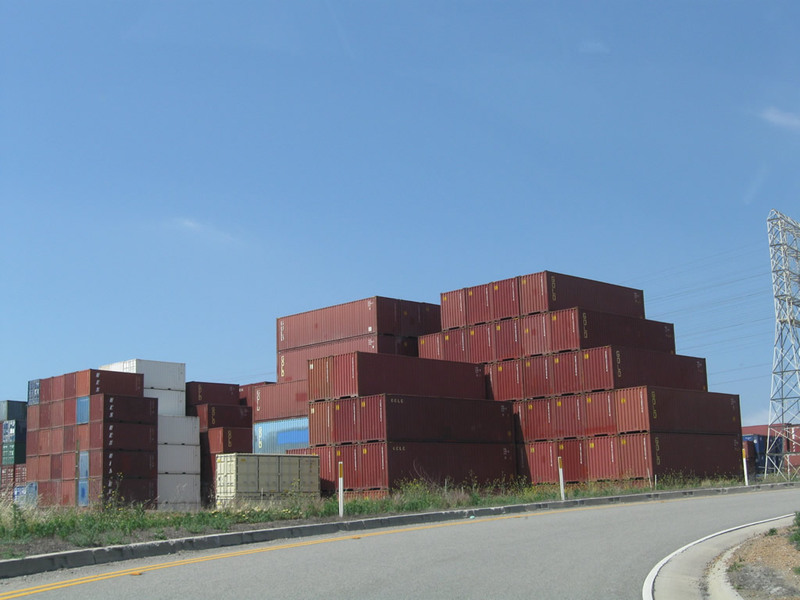 A stack of containers sits on nearby port property as California 103 continues south. Photos taken 05/02/10. California 103 leaves the city of Long Beach and enters the city of Los Angeles. Photo taken 05/02/10. 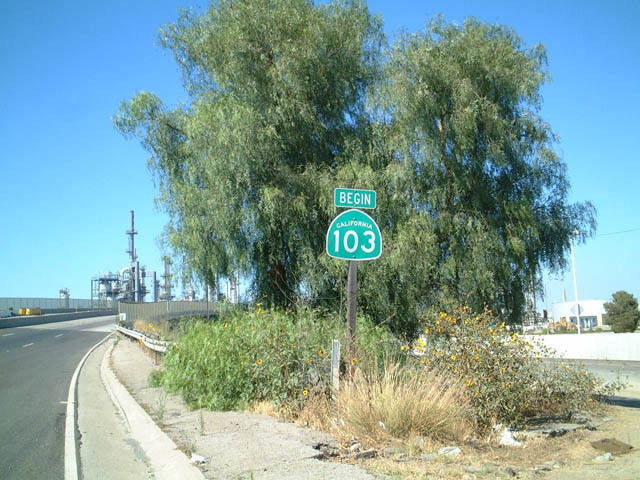 Soon thereafter, California 103 south reaches Exit 1B, Anaheim Street. 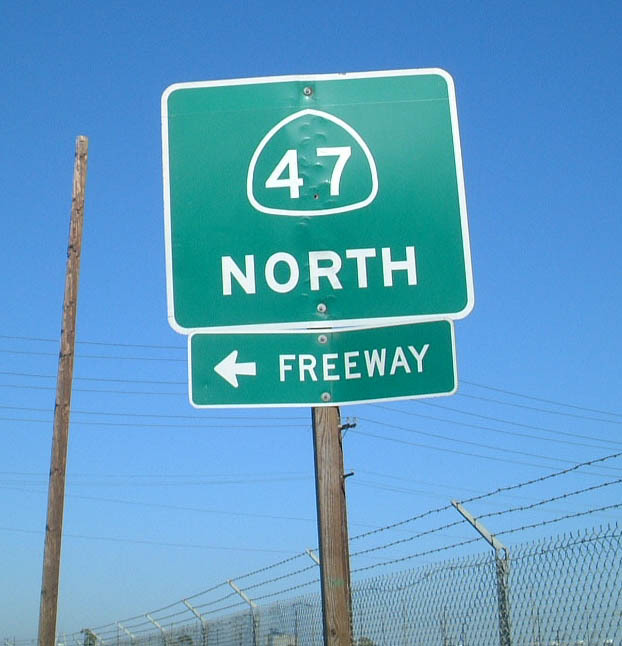 Use Anaheim Street west to California 47 (Alameda Street) north or continue straight ahead to connect to California 47 south. Photo taken 05/02/10. 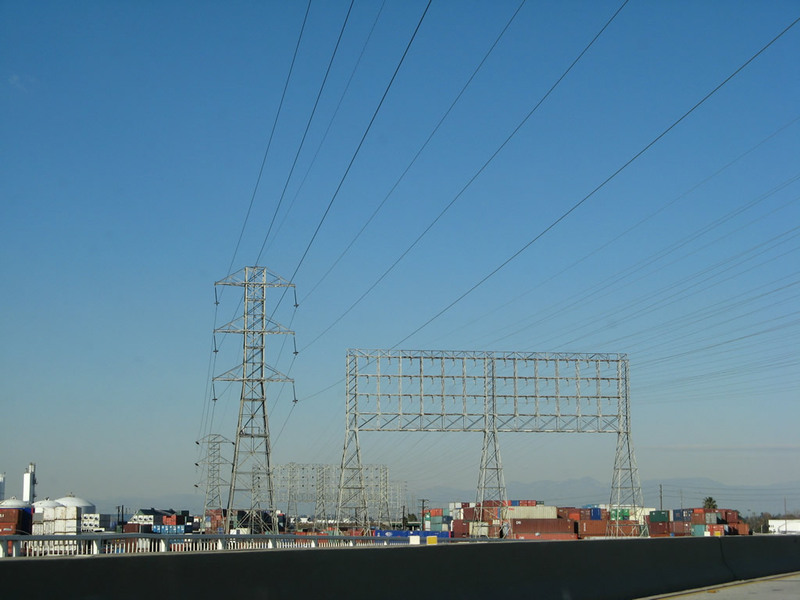 At the gore point for Exit 1B, a set of Southern California Edison power lines prepares to cross over the Terminal Island Freeway. Photo taken 05/02/10. 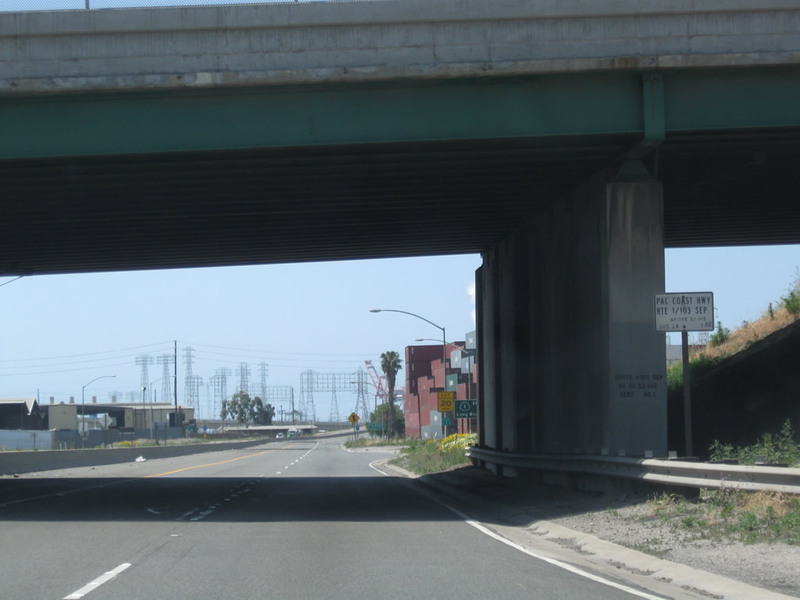 California 103 joins the Anaheim Street viaduct, built in 1947. 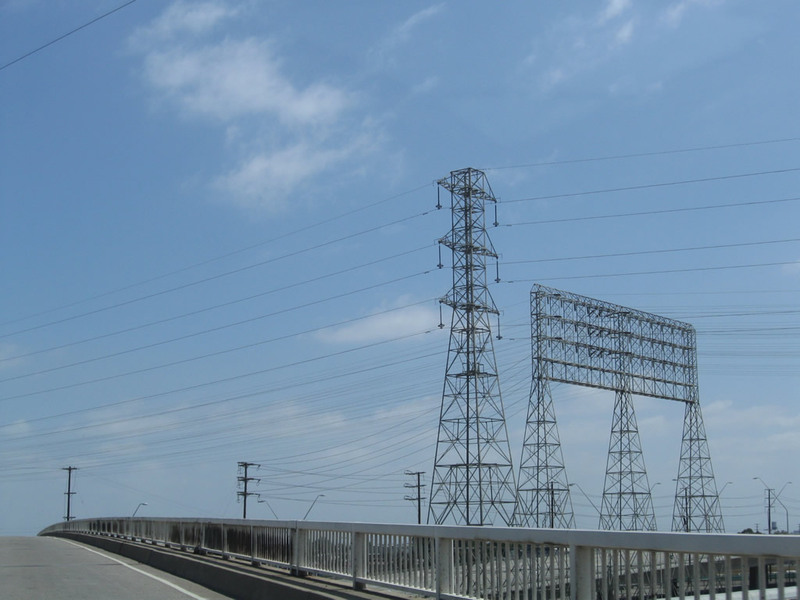 Towering Southern California Edison power lines (including an incredible 12-circuit 69kV tower) cross over California 103. 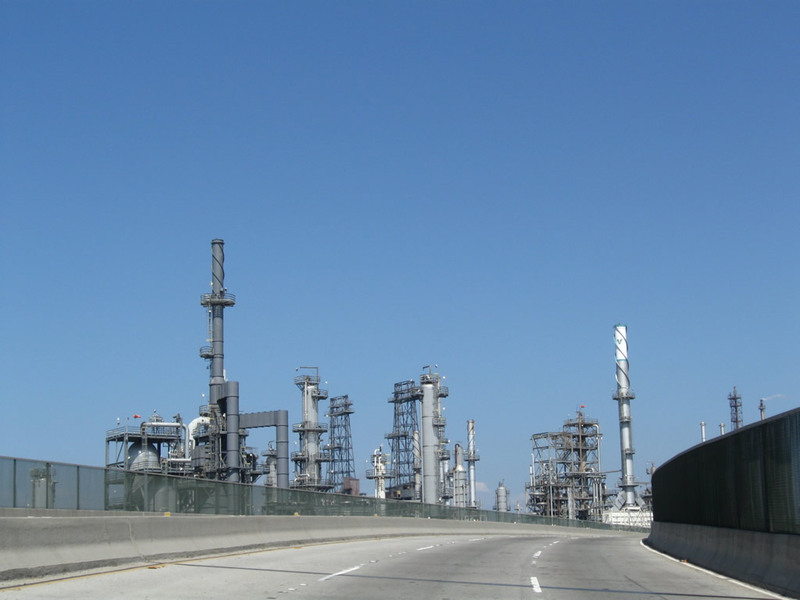 For the next mile or so, California 103 passes oil refineries on both sides of the freeway. Photos taken 05/02/10. 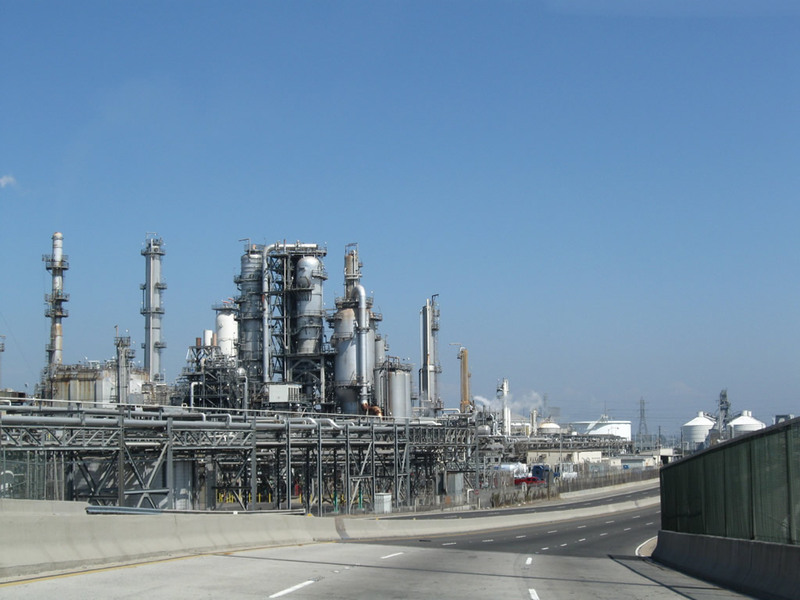 Oil refineries line both sides of the six-lane freeway between the Anaheim Street overcrossing and the Union Pacific overcrossing. Photos taken 05/02/10. California 103 crosses over the Union Pacific Railroad on this 1947 viaduct; it is a steel stringer/multi-beam/girder bridge. 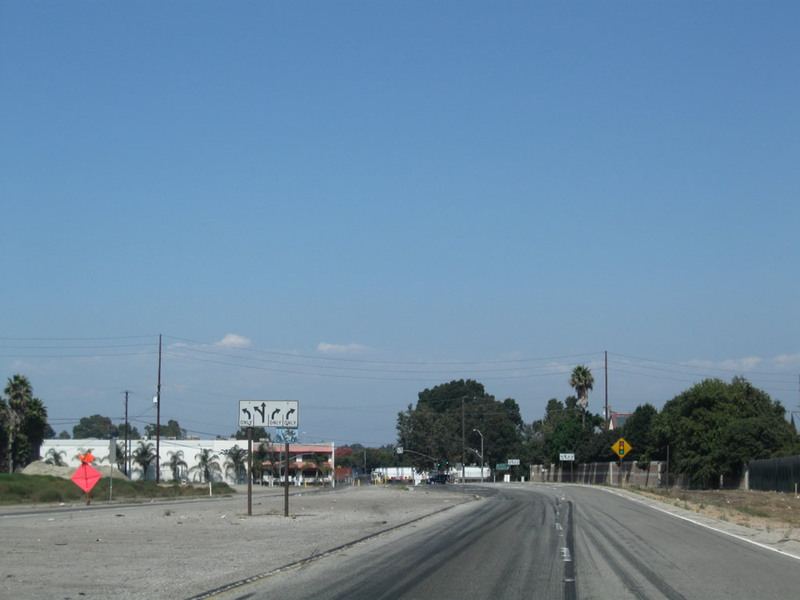 Traffic from California 47/Henry Ford Avenue south merges onto California 103 south after the Union Pacific Railroad overhead. Photos taken 05/02/10. 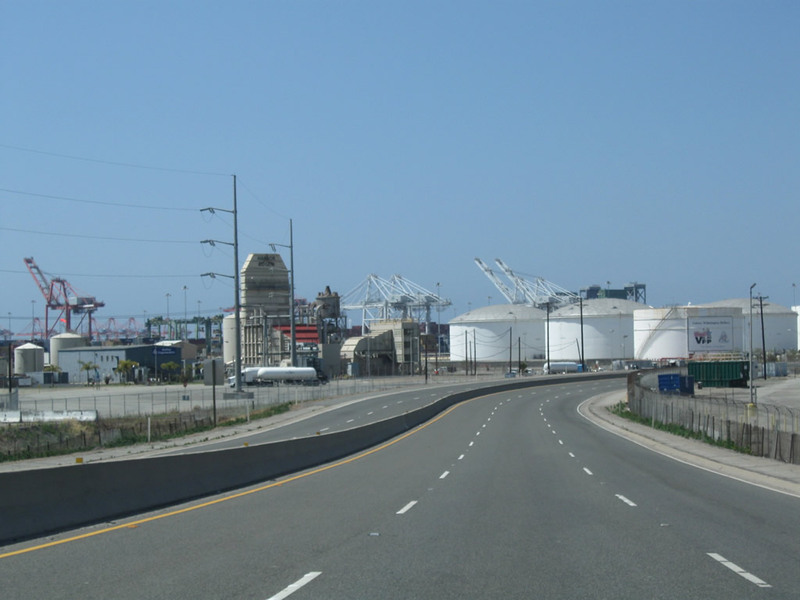 Looking from the through lanes of California 103 south, traffic from California 47/Henry Ford Avenue (and the Alameda Corridor) merges onto the Terminal Island Freeway. 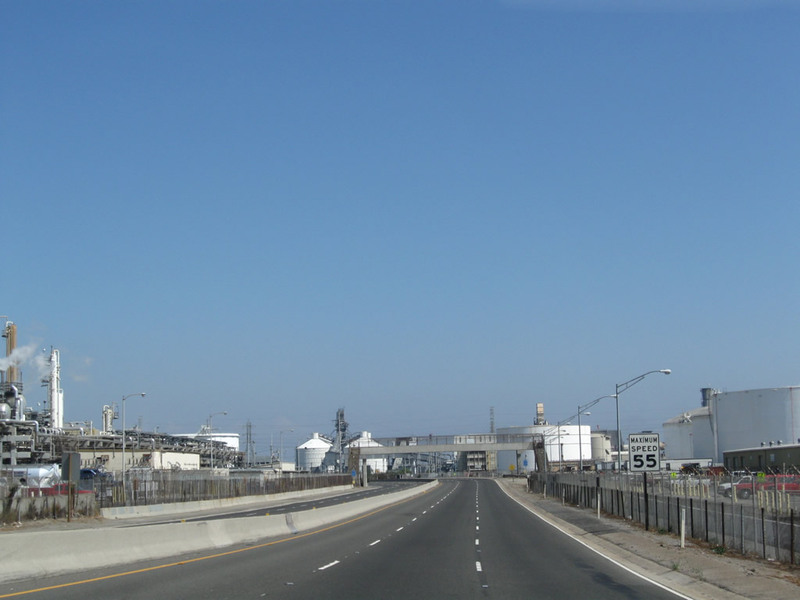 The next exit along southbound California 47 is Exit 4, New Dock Street. Photo taken 05/02/10. 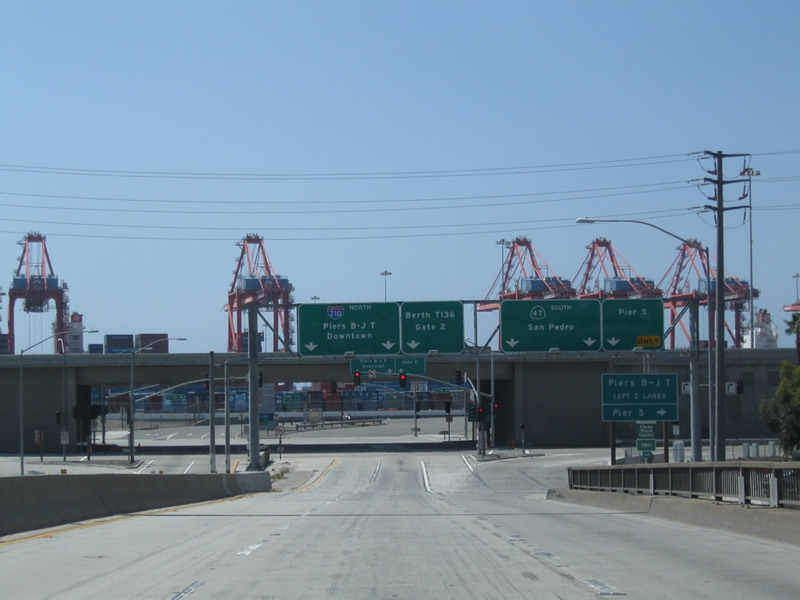 Legislatively, California 103 ends at the interchange with California 47; arguably, California 47 and California 103 merge for the remaining southbound distance of the Terminal Island Freeway. Photo taken 05/02/10. 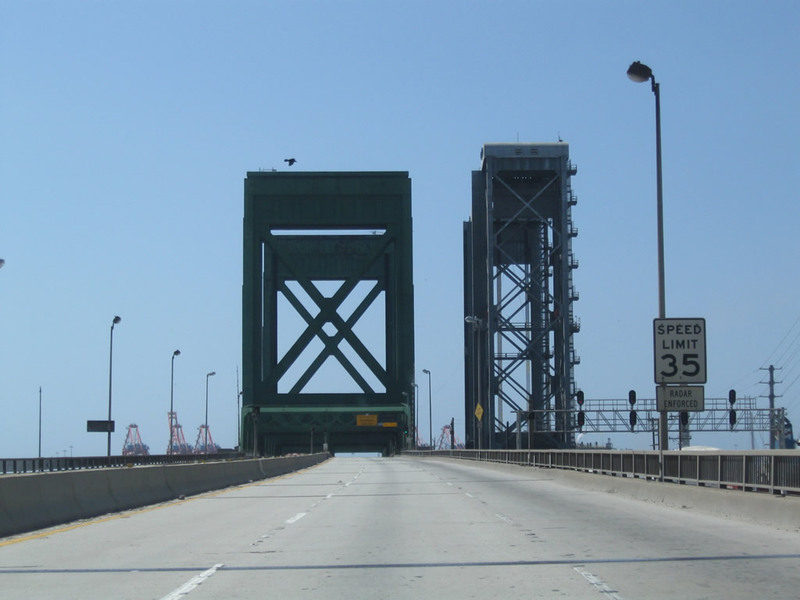 California 47-103 proceeds south across the Commodore Schuyler F. Heim Bridge and enters the city of Long Beach. 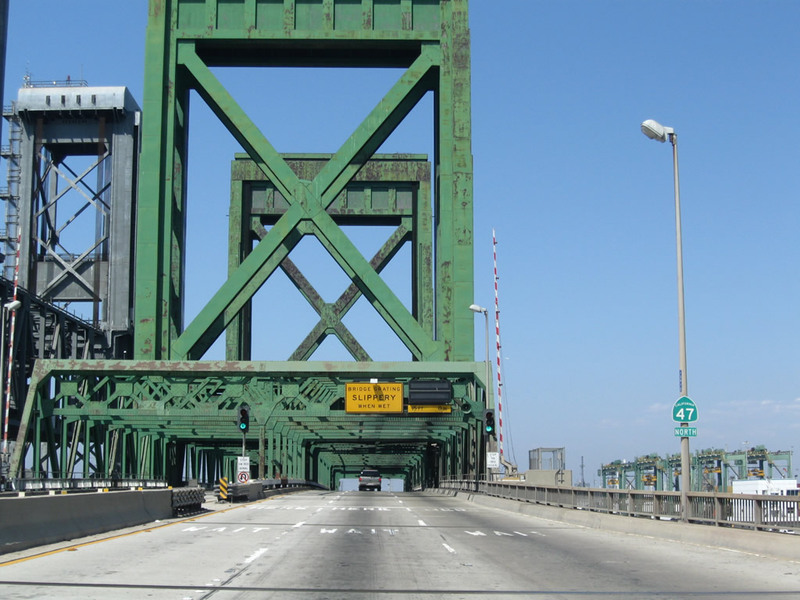 This lift bridge must be raised to allow larger ships to pass underneath it; as a result, the lift bridge can sometimes stop freeway traffic. 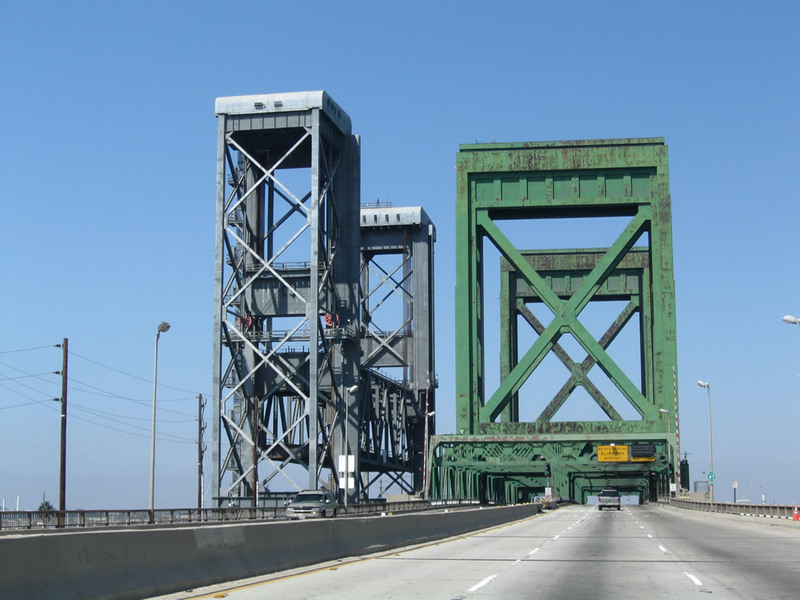 Opened to traffic on January 10, 1948, the Heim Bridge carries vehicular traffic over the Cerritos Channel but is seen as functionally deficient due to heavy truck wear and tear and closures due to lift operations. 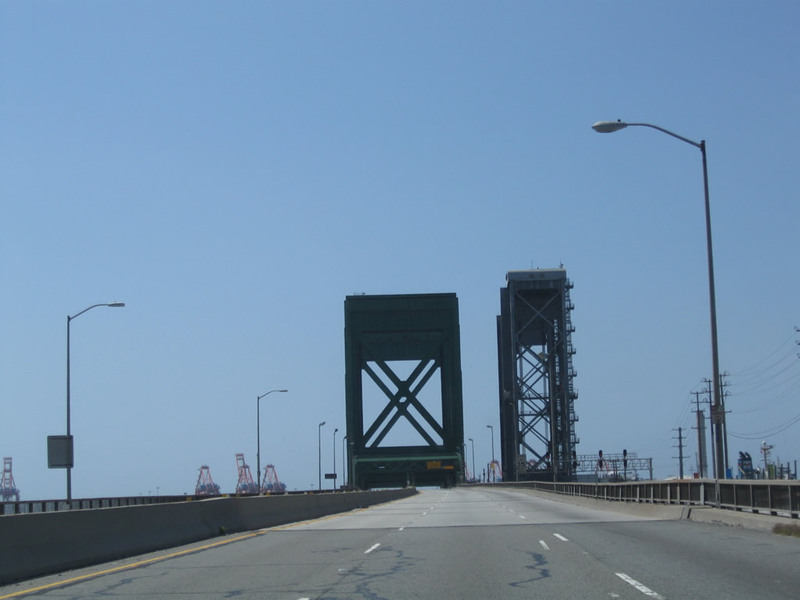 The steel grate deck of the bridge allows for a lighter deck for lifting purposes.2 Plans call for the Heim Bridge to be replaced by a new span as part of the Port Access Expressway project to be coordinated by Alameda Corridor Transportation Authority. Photos taken 09/28/08 and 05/02/10. 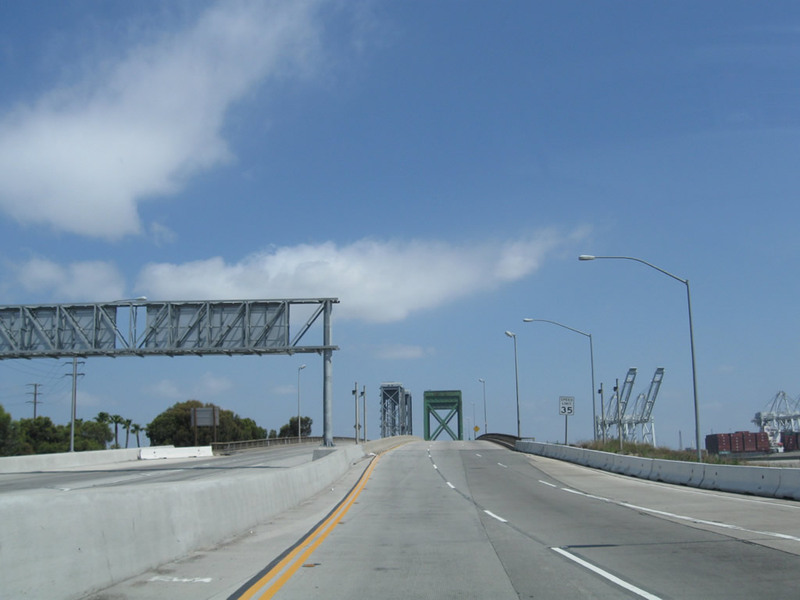 After leaving the Heim Bridge, southbound California 47-103 (Terminal Island Freeway) meets Exit 4, New Dock Street. 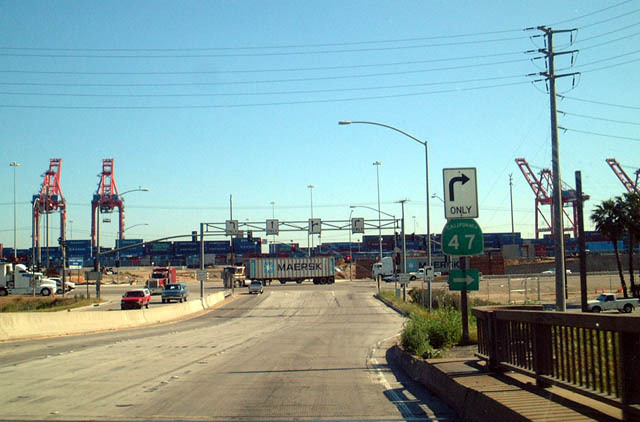 Moviegoers may recognize some of this industrial area around the lift bridge; in fact, the lift bridge can be clearly seen on the section of the "New Jersey Turnpike" portrayed in the movie Being John Malkovich. 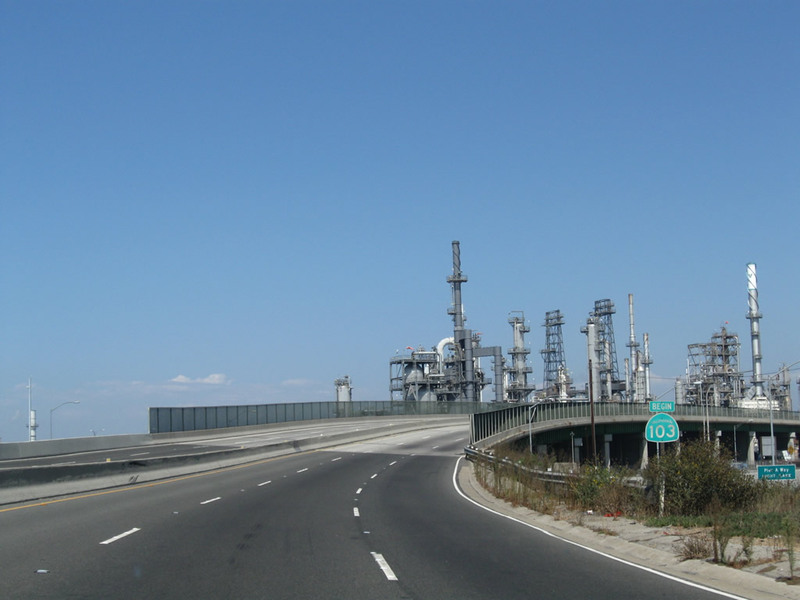 All of the scenes showing the characters landing alongside the "turnpike" after their trip in John Malkovich&apos; head were in reality landing in a ditch alongside California 47 with some seemingly authentic Interstate shields with the state name. 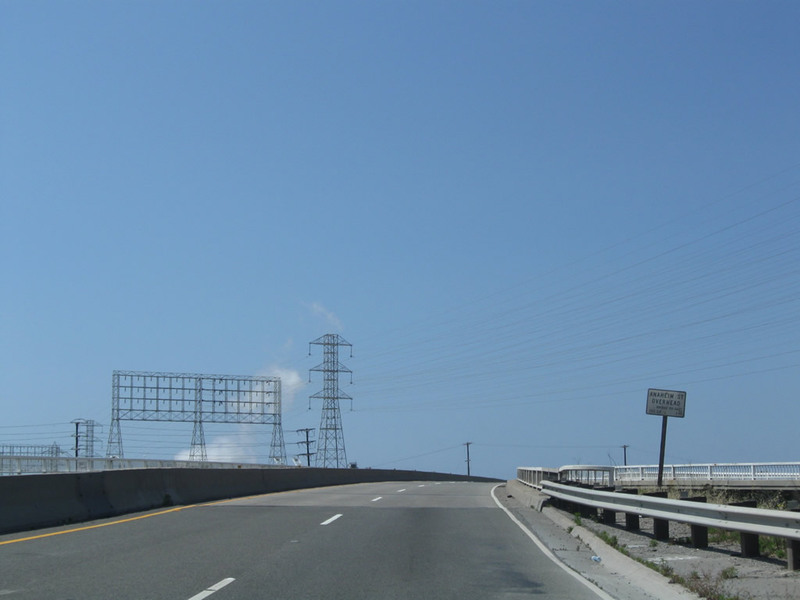 (Note that these New Jersey shields would be authentic if the scenes were filmed on a road maintained by the New Jersey Department of Transportation, but the design of that shield is not used on the turnpike.) Photo taken 05/02/10. 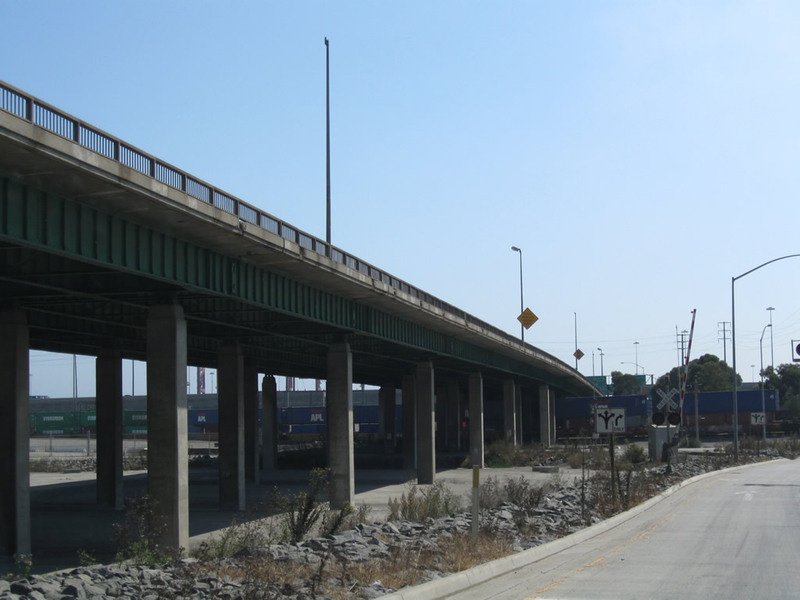 This series of photos follows the off-ramp from California 47-103 south to New Dock Street. Photos taken 09/28/08. 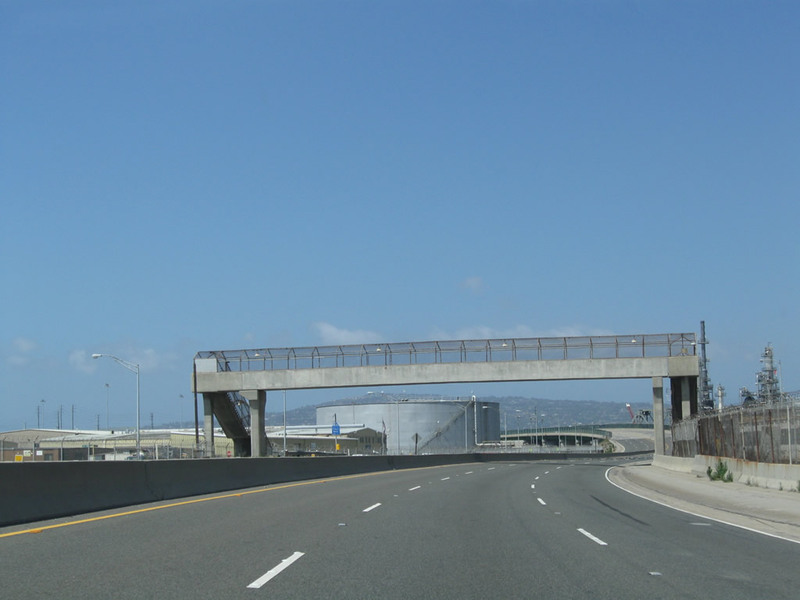 A viaduct carries California 47-103 south between the Schuyler Heim Bridge and the Ocean Boulevard interchange. 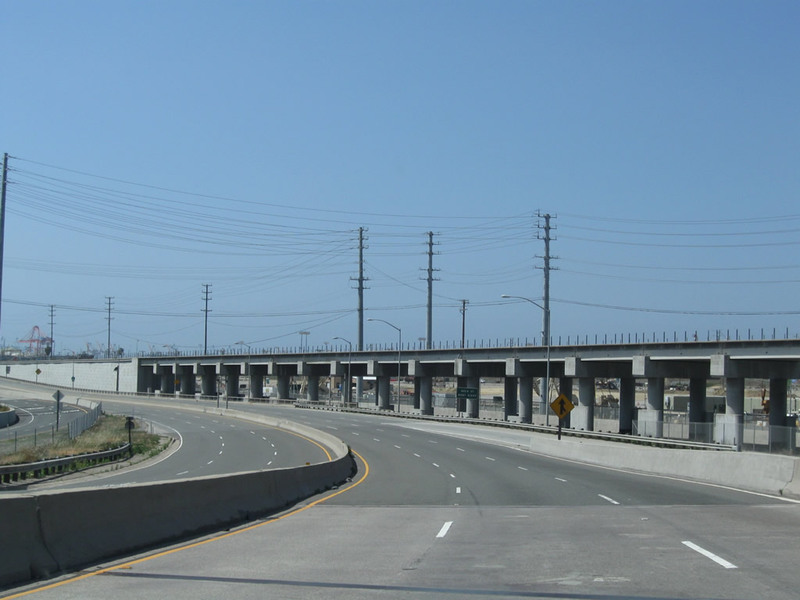 Once the Port Access Expressway is constructed, a direct transition ramp carrying California 47 through this interchange will enable a freeway to freeway connection here. Photo taken 05/02/10. 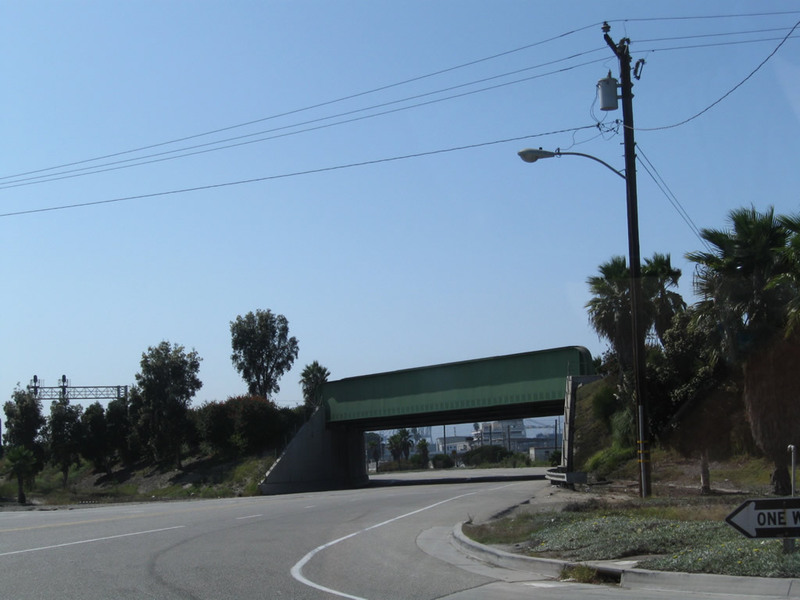 Prior to the completion of the diamond interchange between the Terminal Island Freeway and Ocean Boulevard, this trailblazer for California 47 south pointed the way from soutbound Terminal Island Freeway to westbound Ocean Boulevard (which becomes Seaside Avenue upon crossing into Los Angeles). 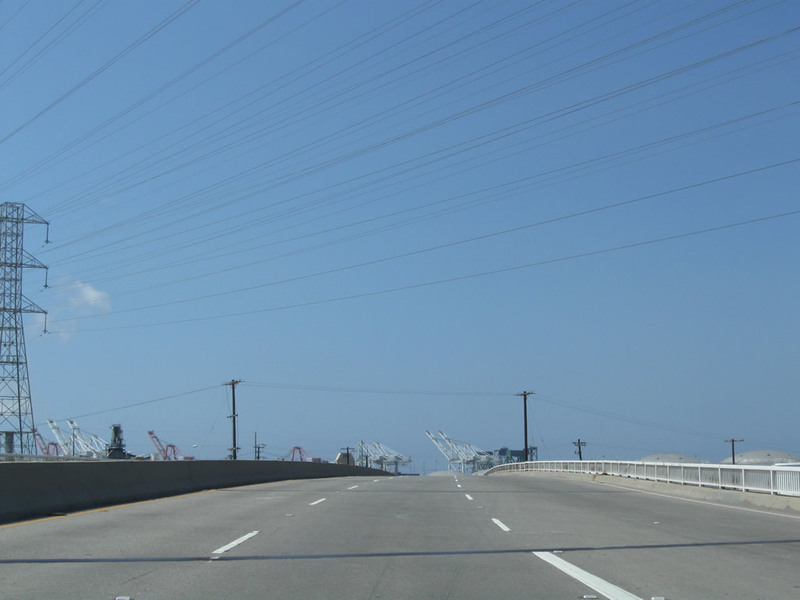 At this intersection (which is now Exit 3 since it was upgraded to an interchange in 2007), California 47 turns right onto the Seaside Freeway, heading southwest toward the Vincent Thomas Bridge, Interstate 110 (Harbor Freeway), and Gaffey Street to San Pedro. 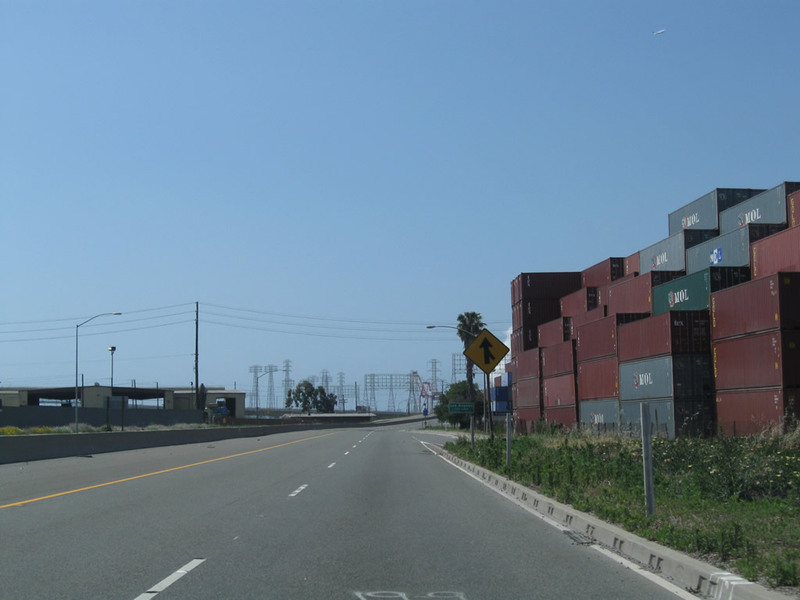 Note all of the shipping containers to the left of this roadway. Photo taken 03/30/03. 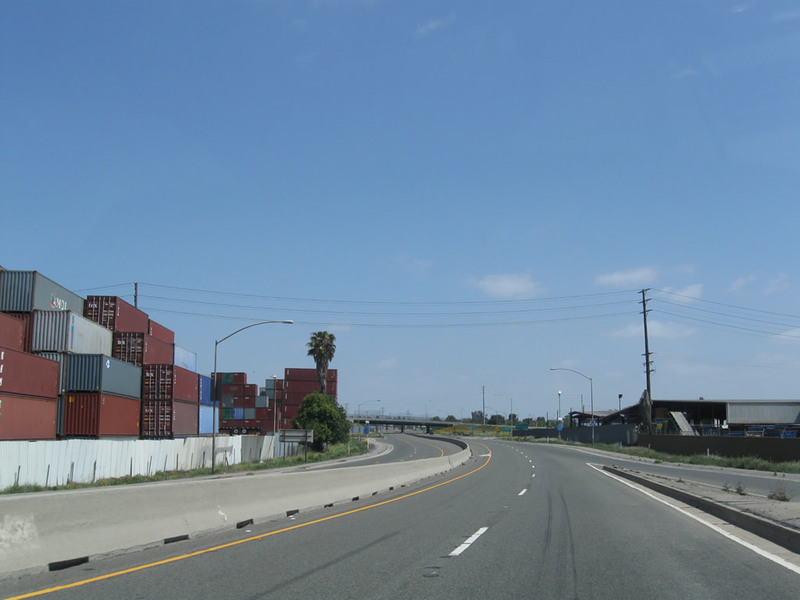 With the new interchange in place, the traffic signal now links the Terminal Island Freeway with a frontage road for Ocean Boulevard. Photo taken 05/02/10. 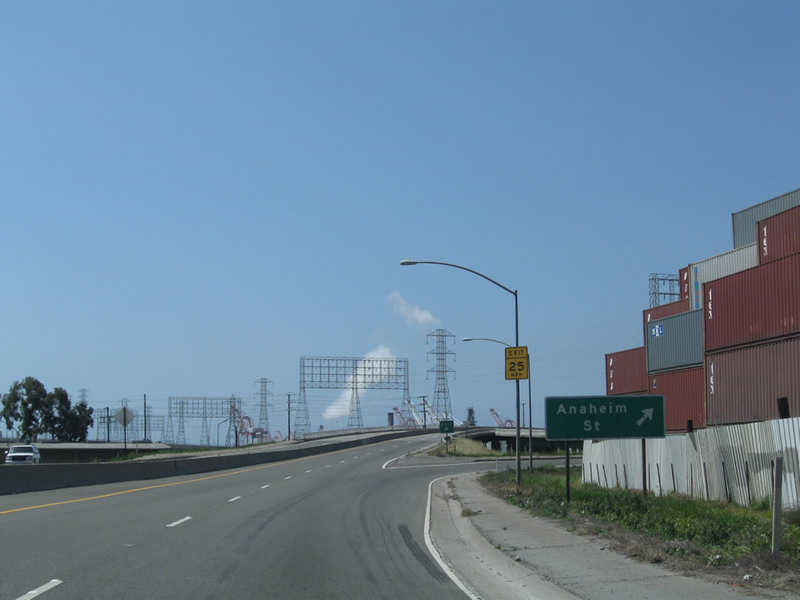 Southbound California 47-103 (Terminal Island Freeway) approaches Ocean Boulevard. 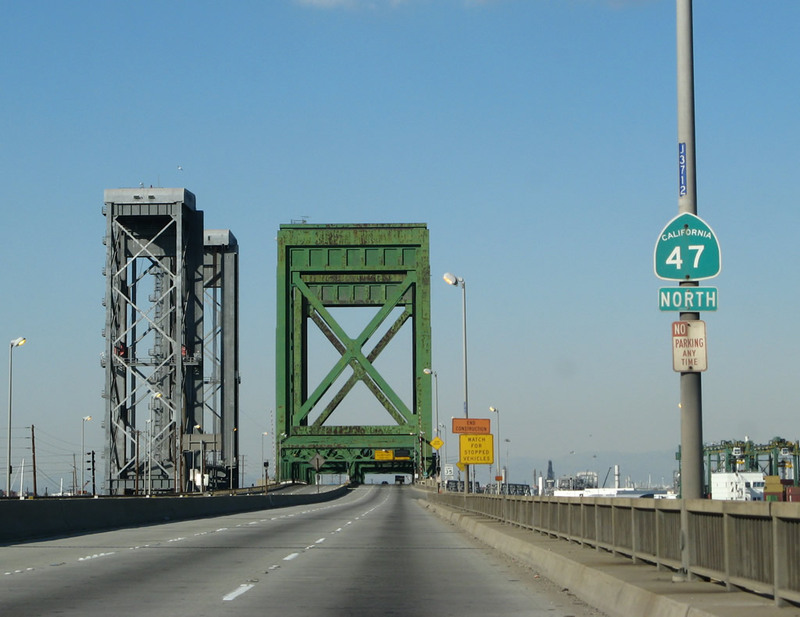 The next right carries California 47 south to the Vincent Thomas Bridge and San Pedro. 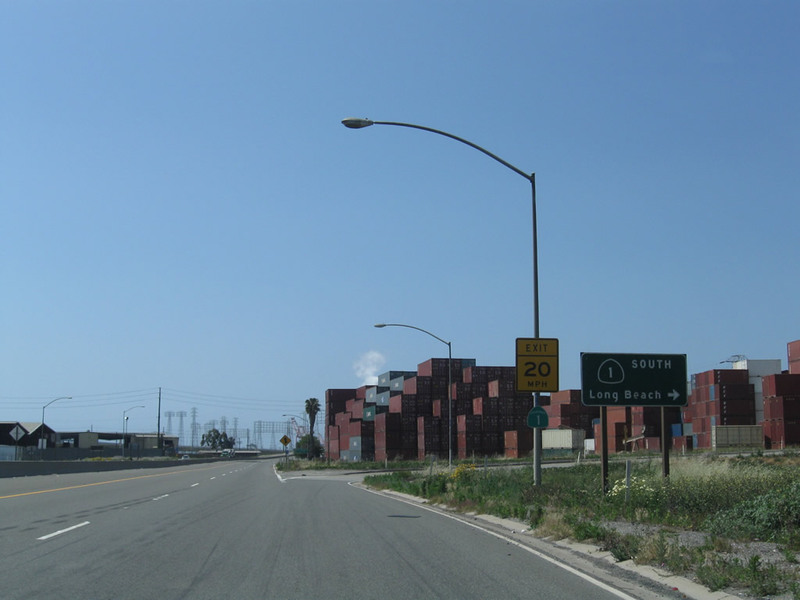 To Interstate 710 (Long Beach Freeway) to downtown Long Beach and points north, pass under the freeway and turn left at the second traffic signal. 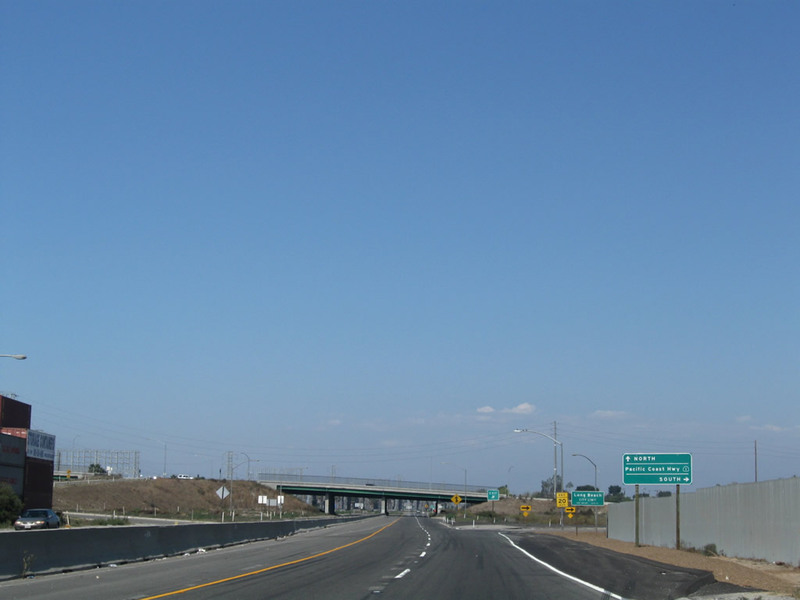 This interchange marks the southern terminus of California 103 (although no shields for it are currently posted along southbound after the Heim Bridge). Photos taken 05/02/10. 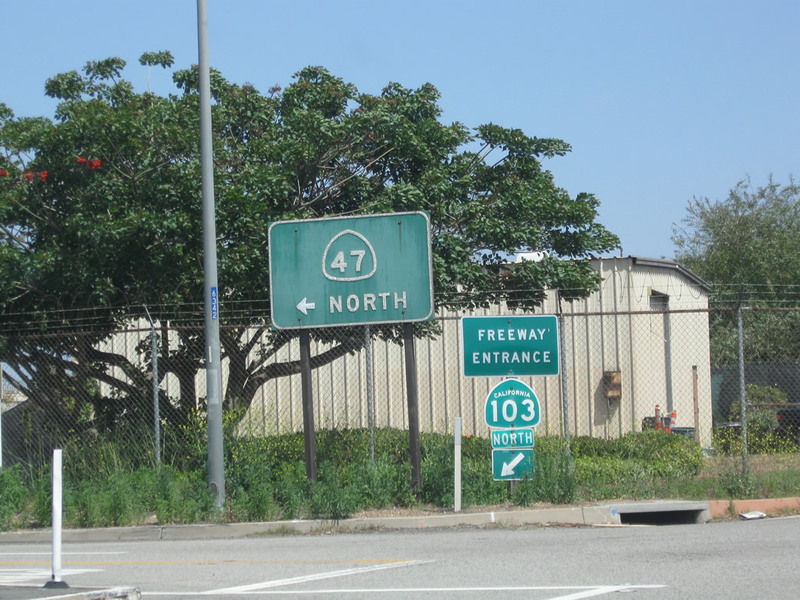 This freeway entrance shield assembly is posted on the ramp from California 1 north to California 103 north. The route marker shows California 103, but the green guide sign is older and shows California 47. 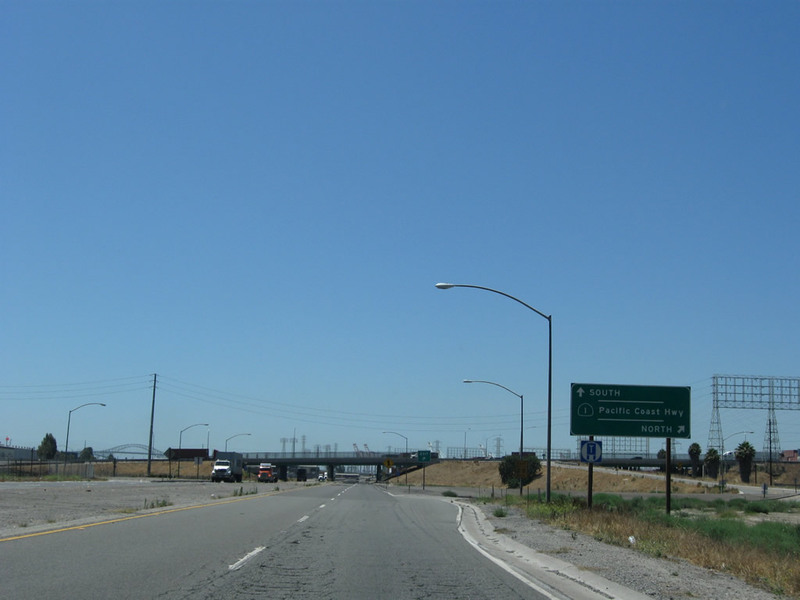 With the relocation of California 47 to the Alameda Corridor, this sign should be fixed to say only California 103. Photo taken 05/02/10. 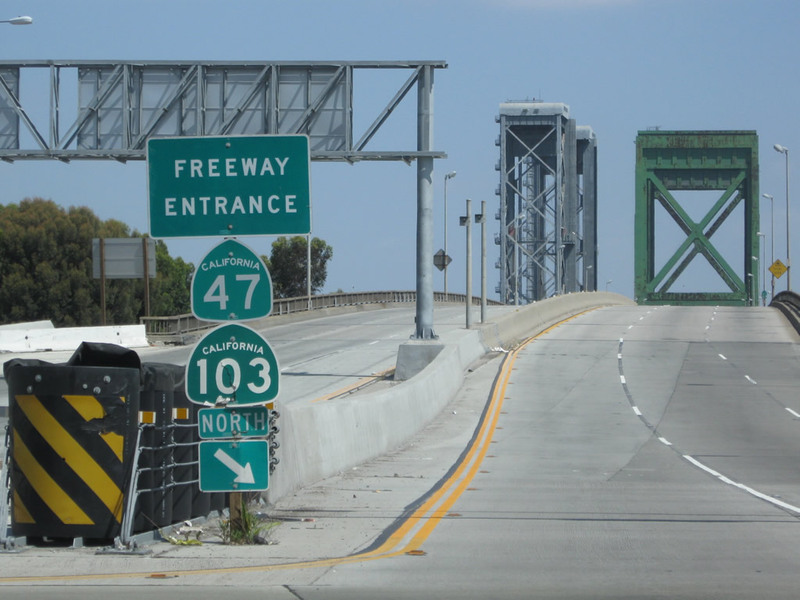 This freeway entrance signage was previously posted on the ramp from California 1 (Pacific Coast Highway) north to California 103 (Terminal Island Freeway) north. This sign assembly should technically only have California 103 shields, but it was at the time signed for California 47. This sign is now gone. Photo taken 03/30/03. 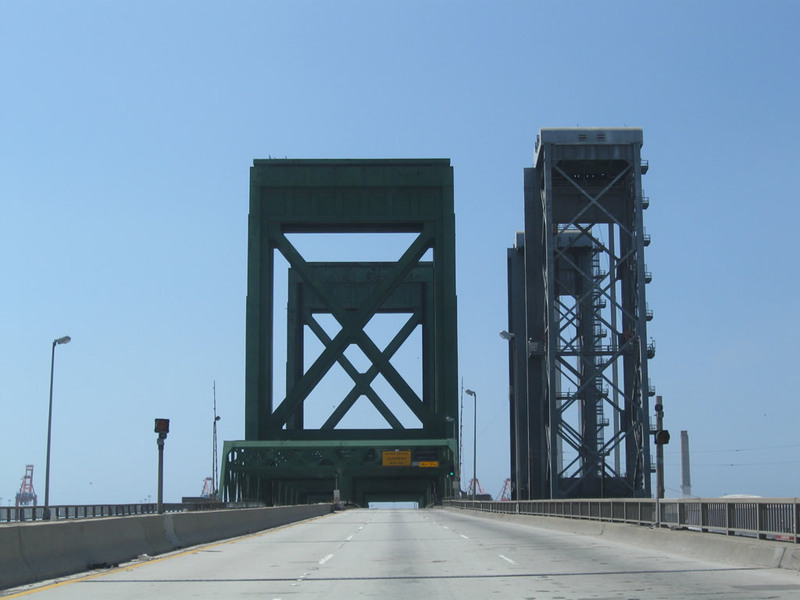 Schuyler Heim Bridge Replacement and SR-47 Expressway Project Record of Decision - August 2009. Page Updated October 21, 2010.